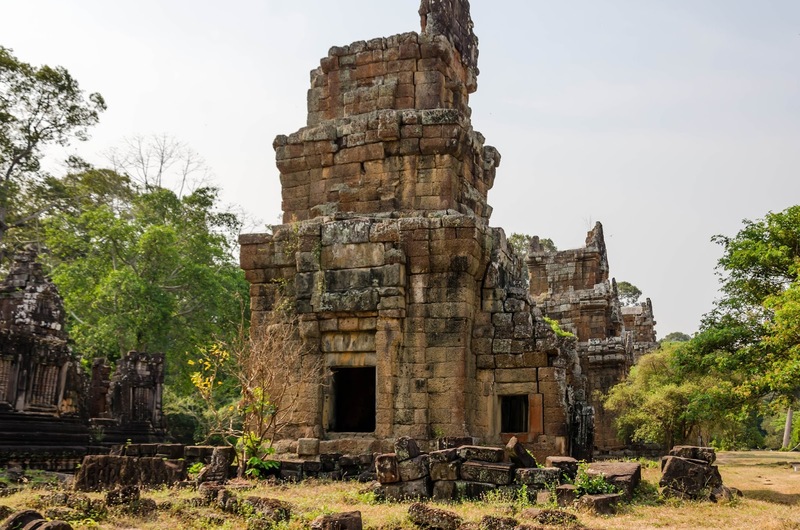 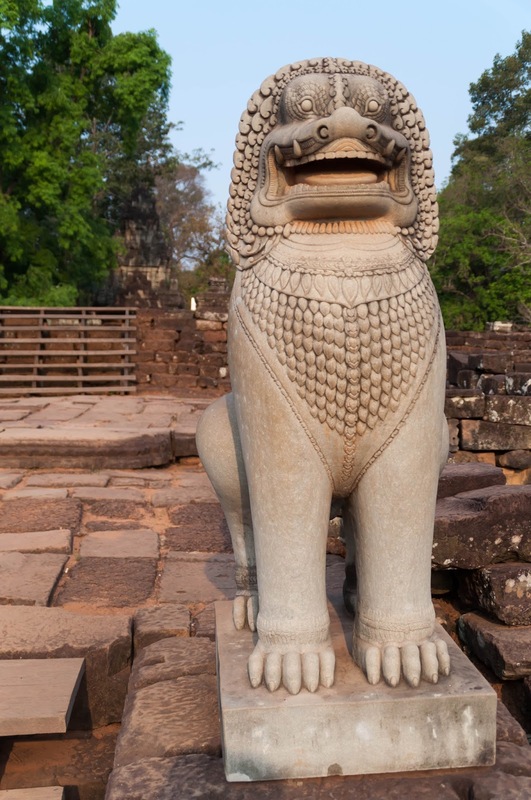 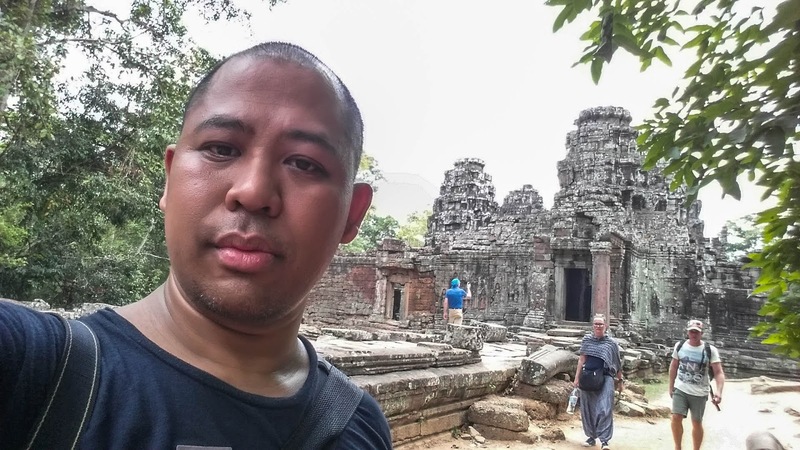 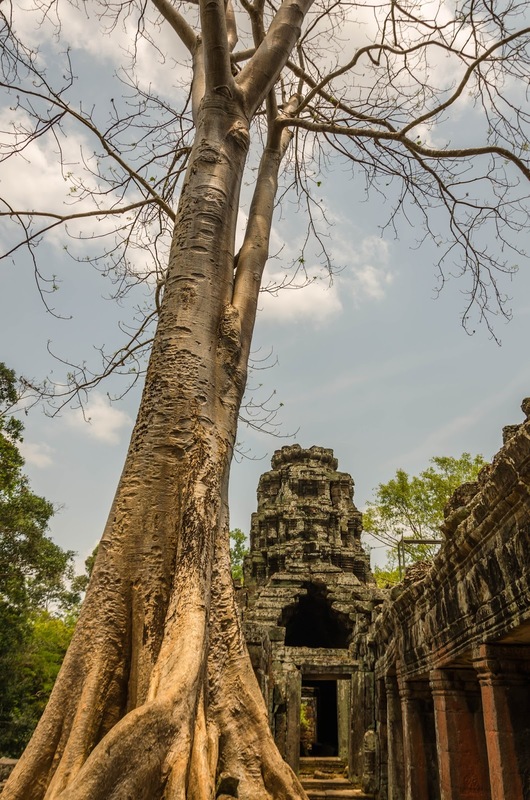 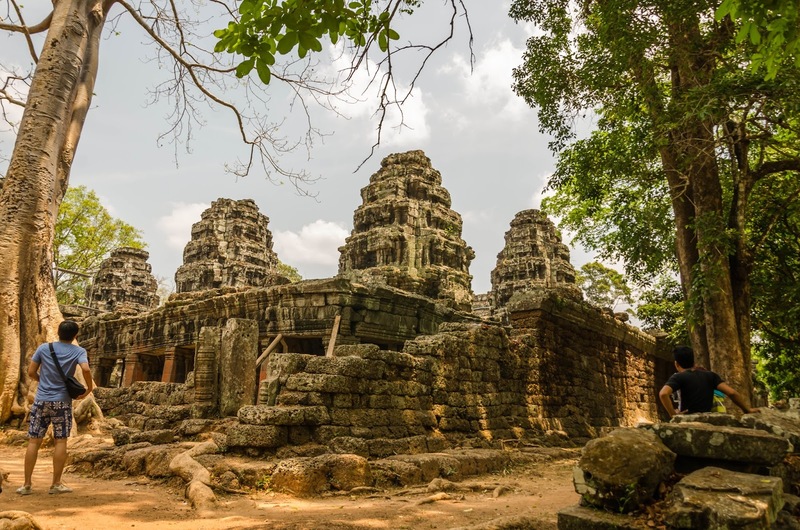 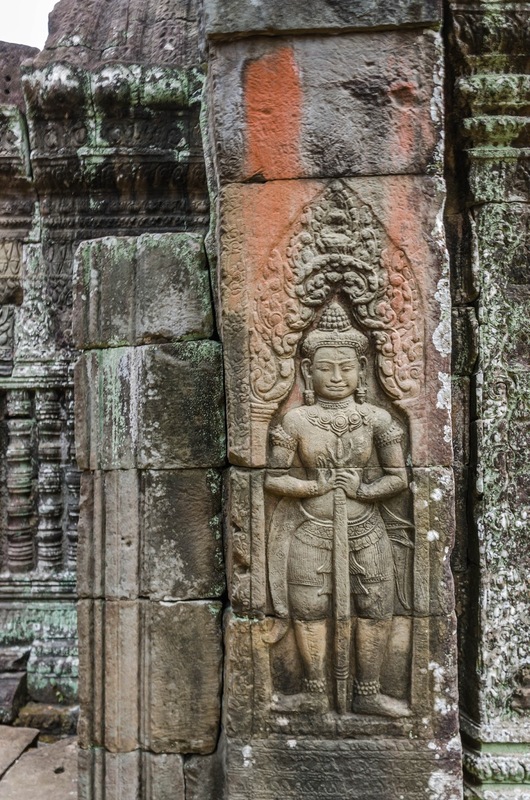 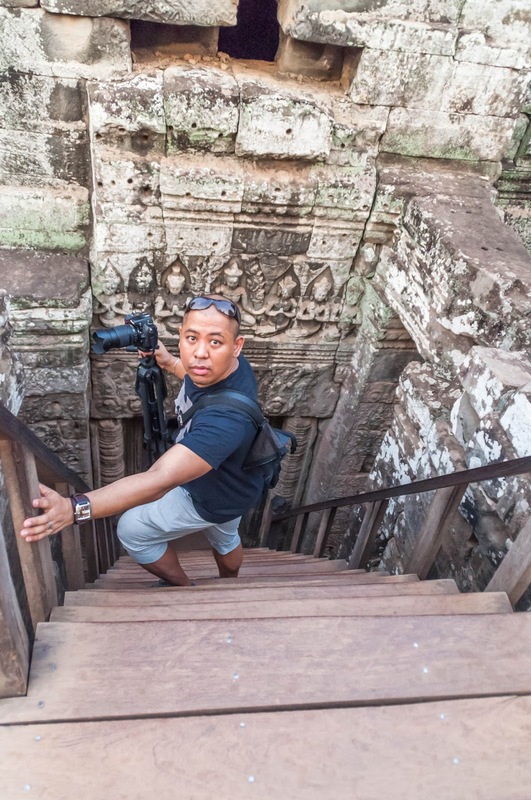 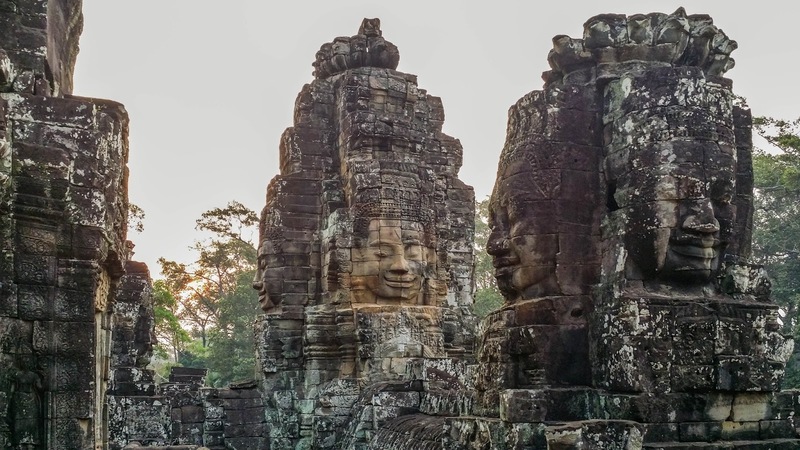 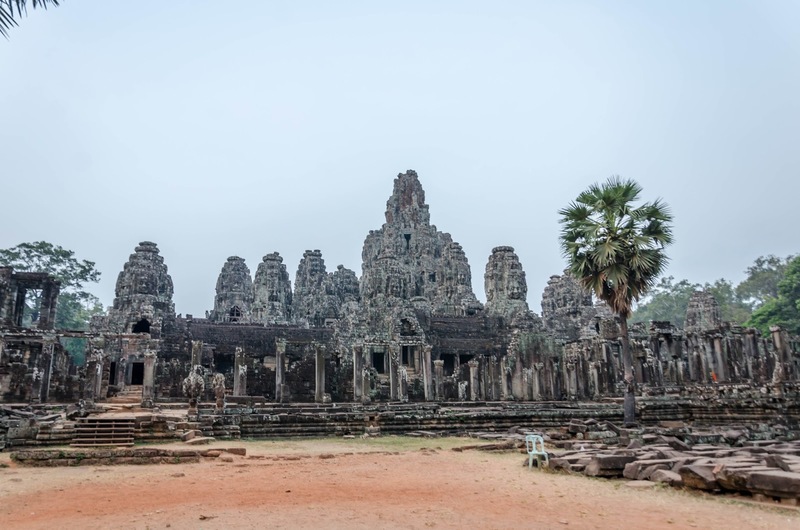 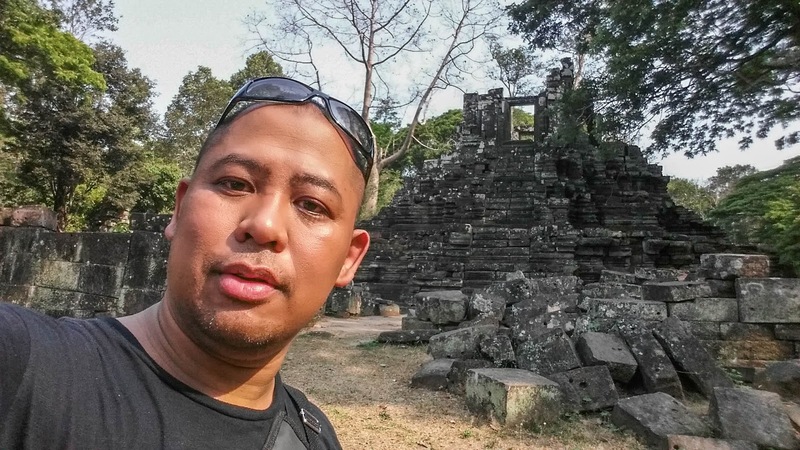 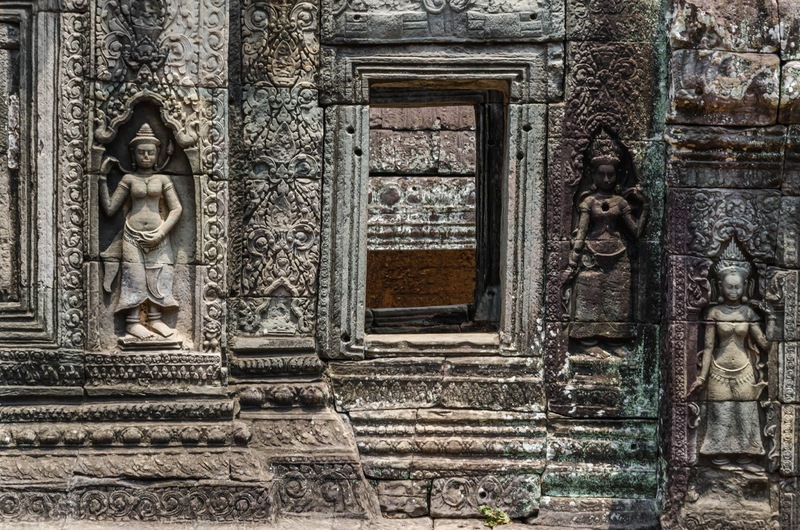 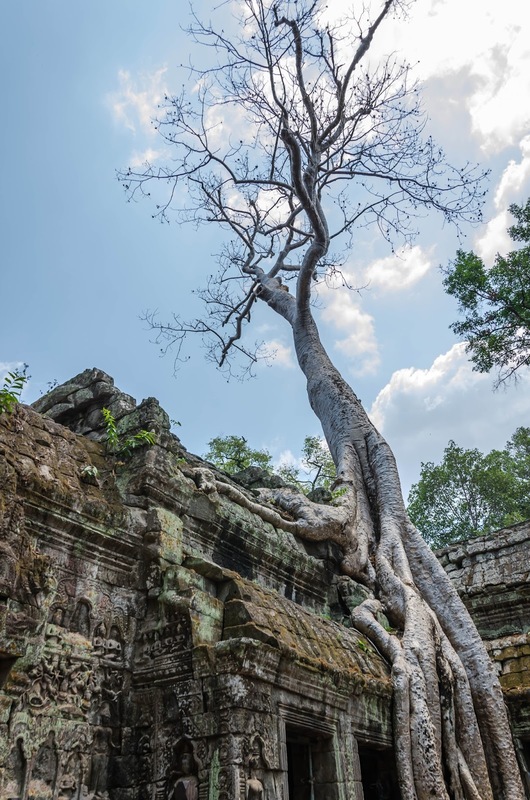 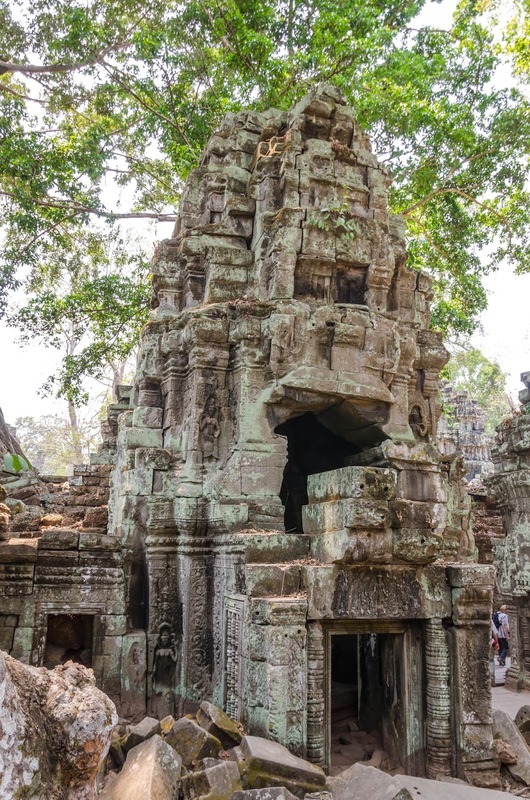 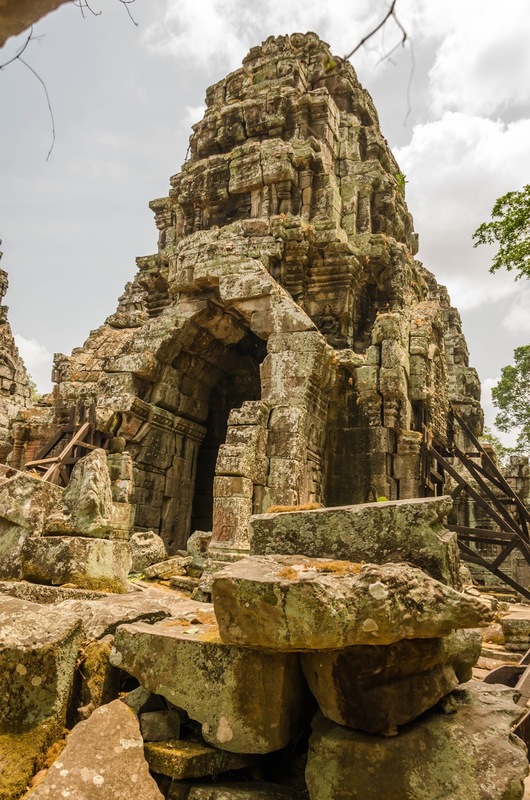 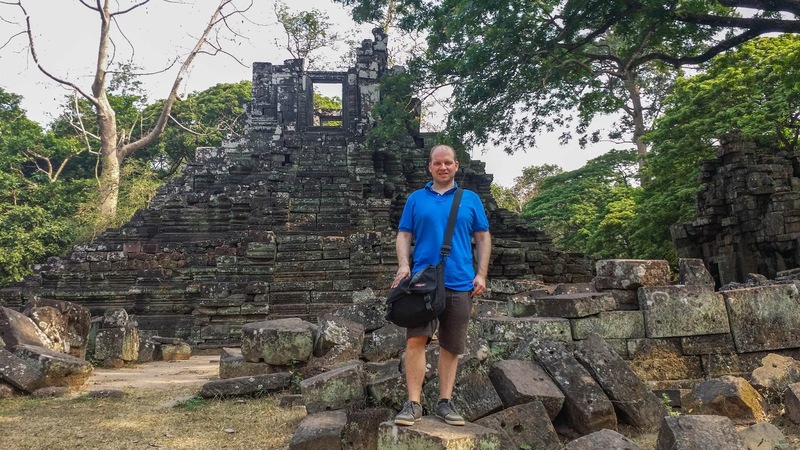 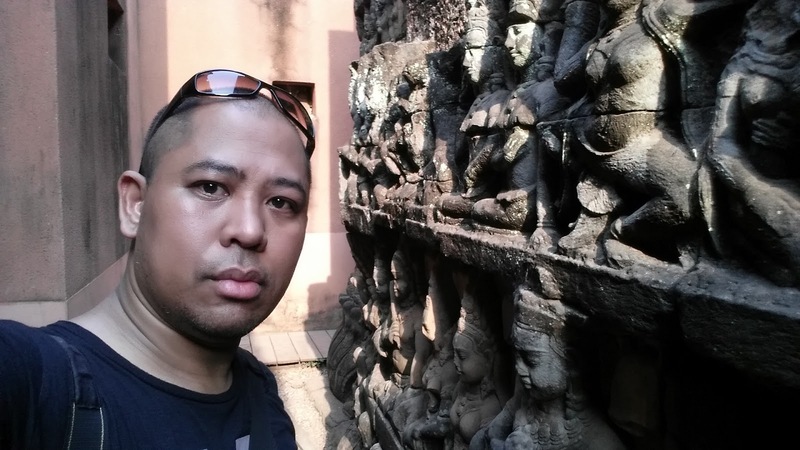 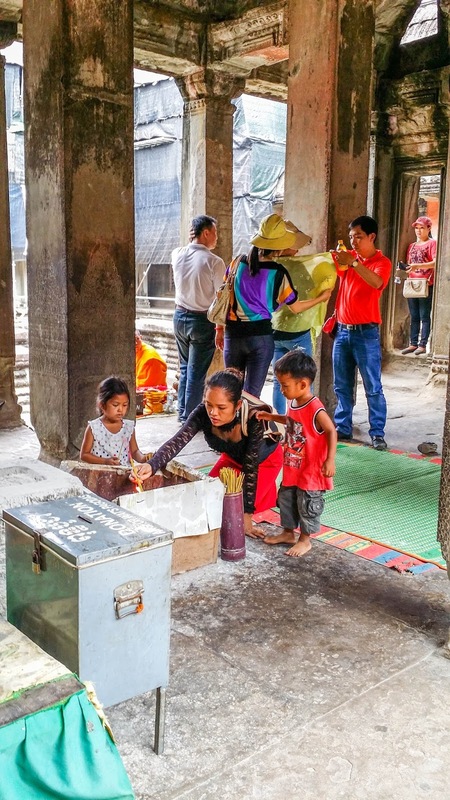 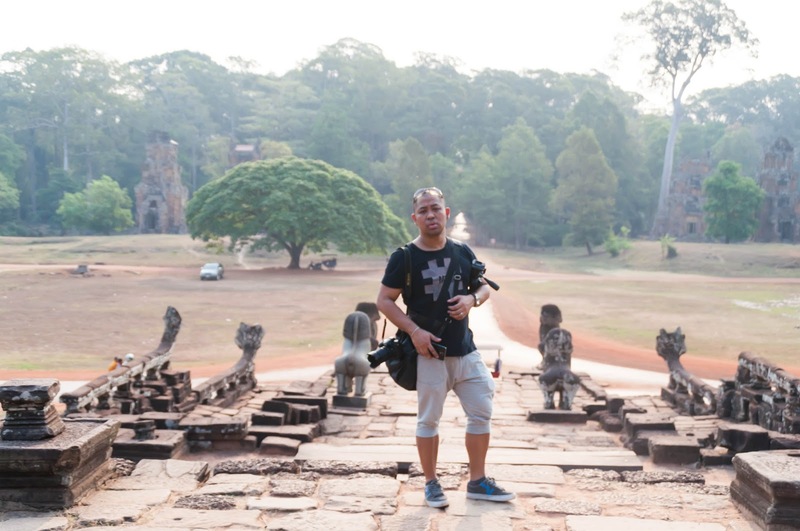 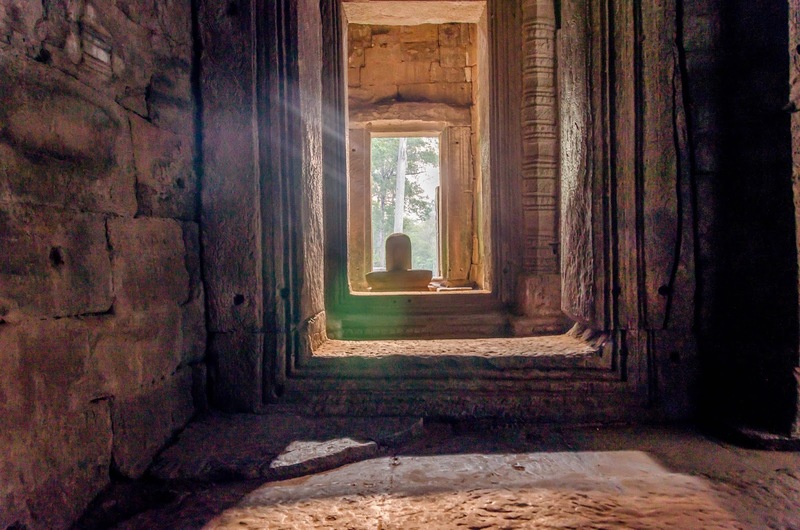 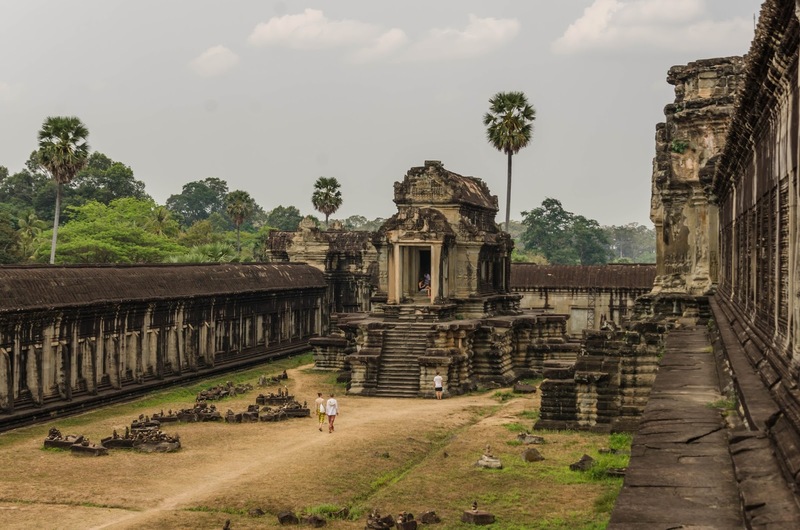 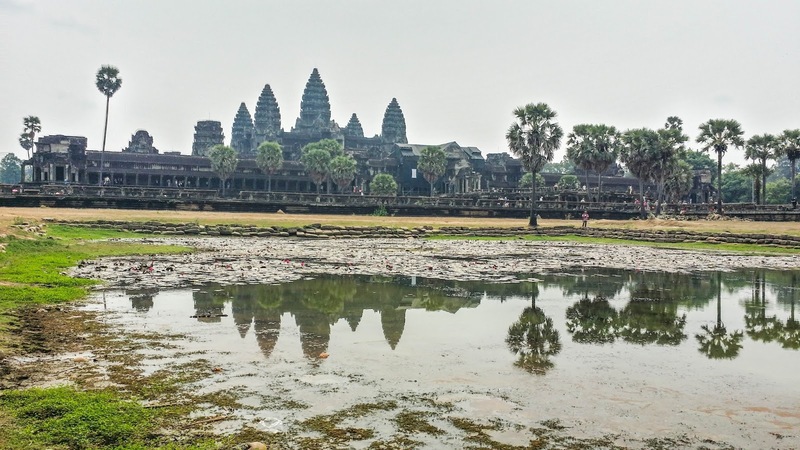 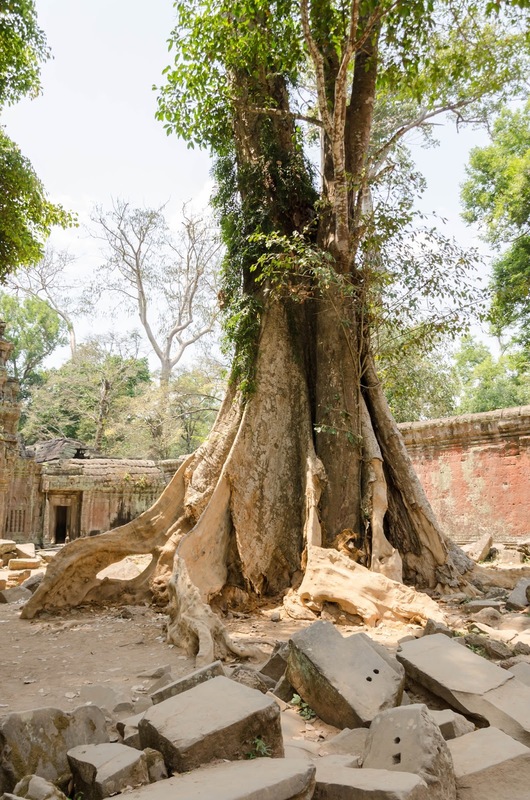 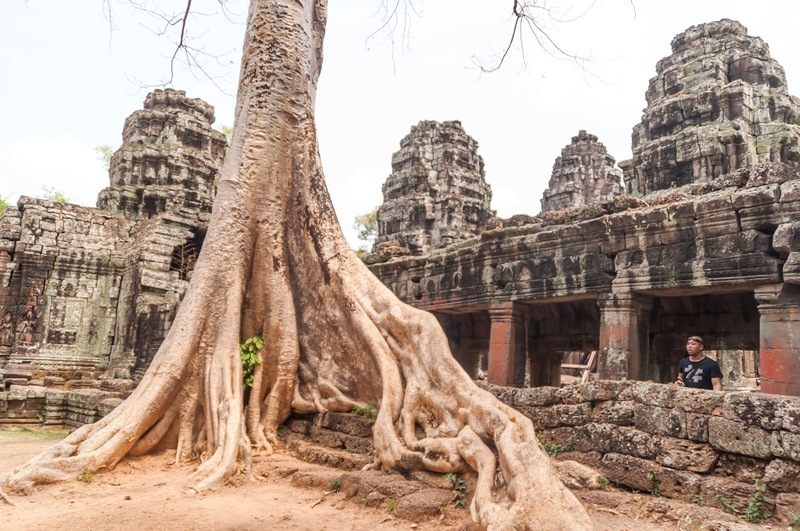 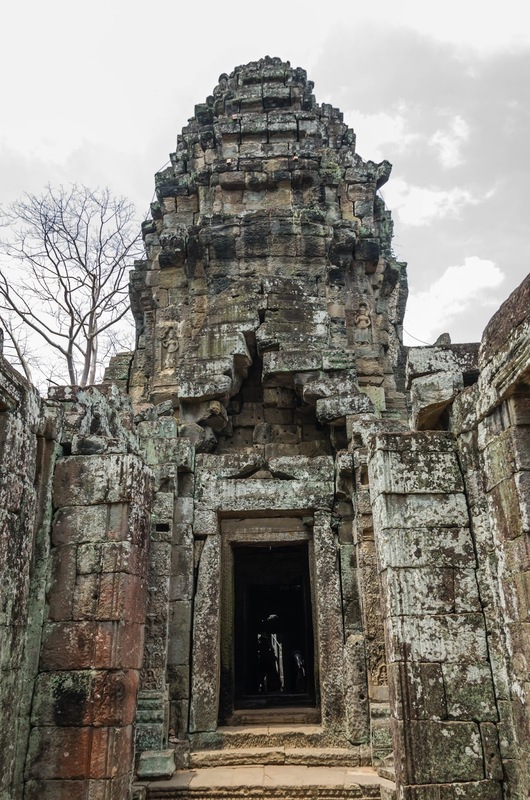 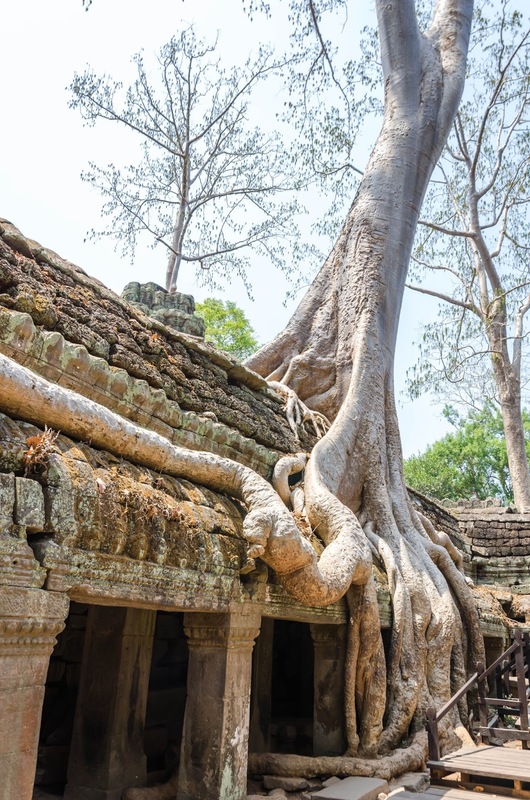 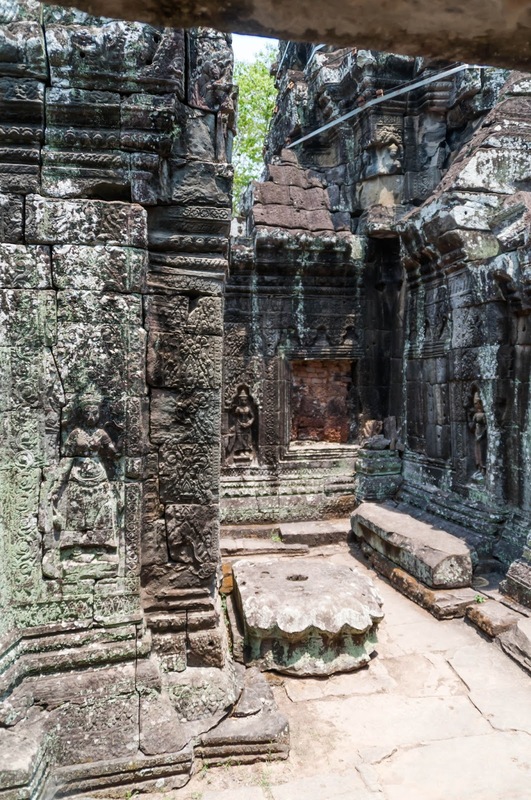 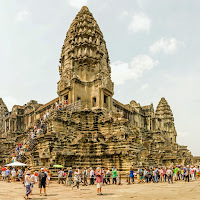 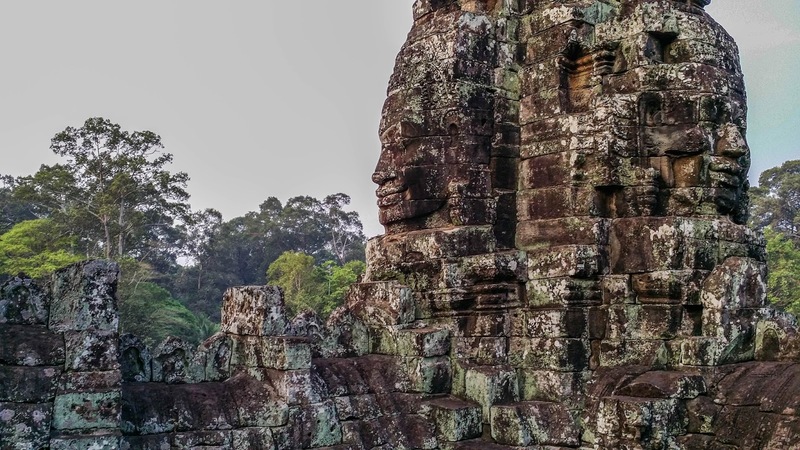 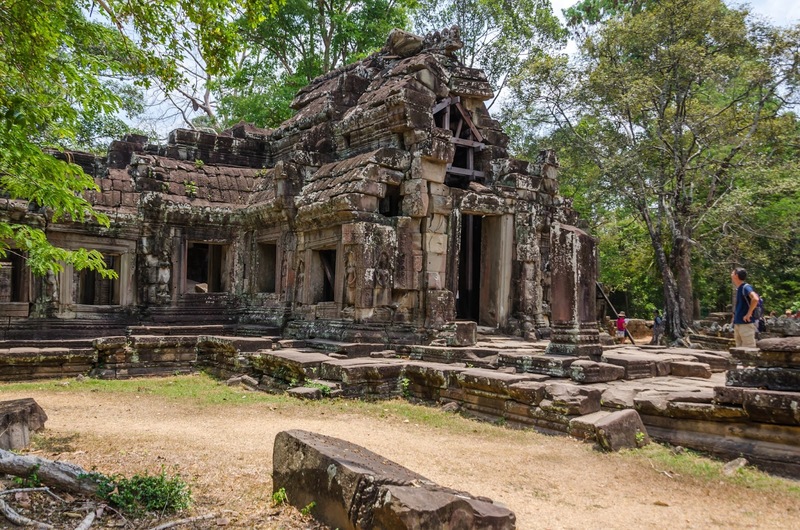 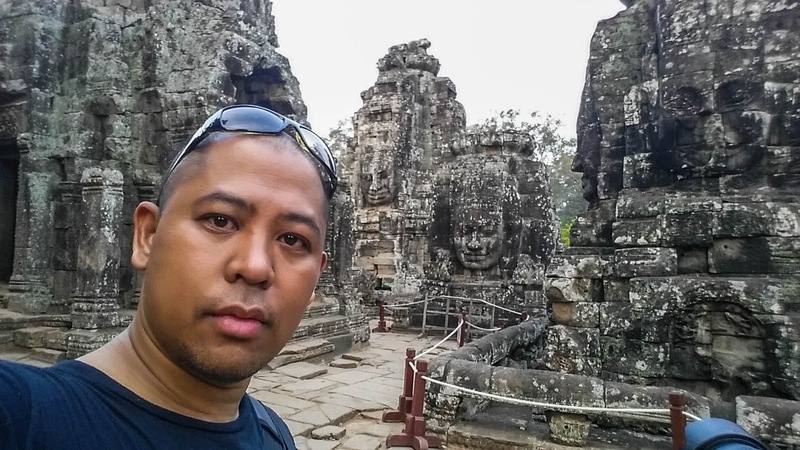 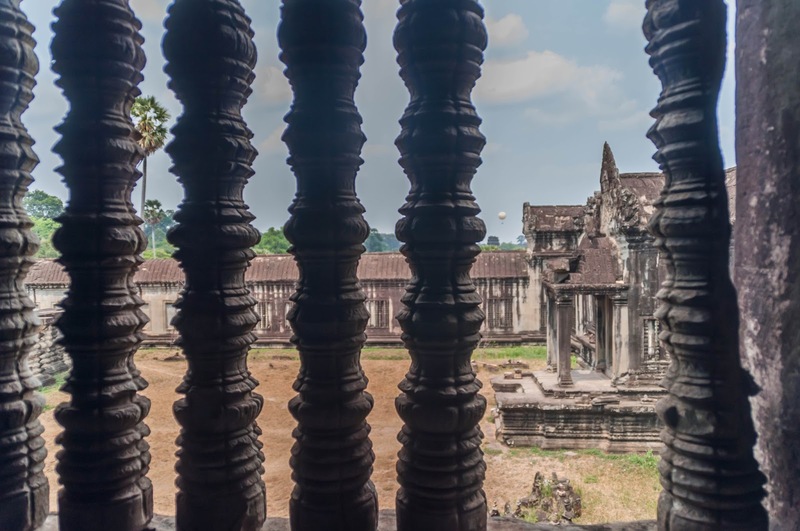 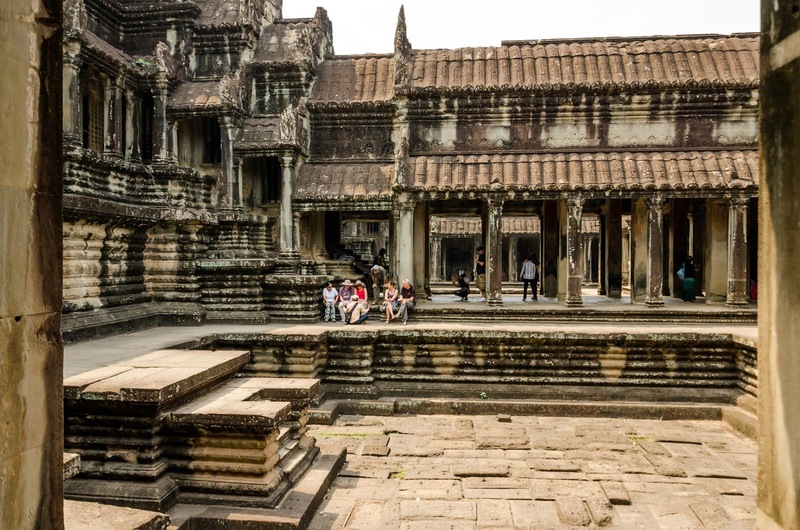 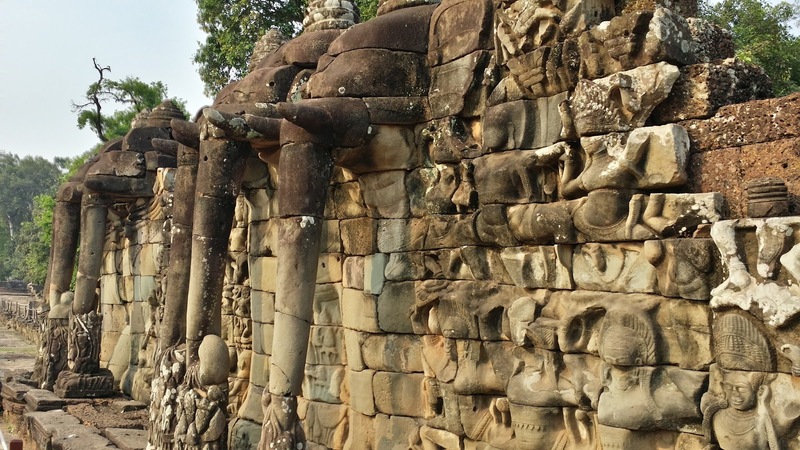 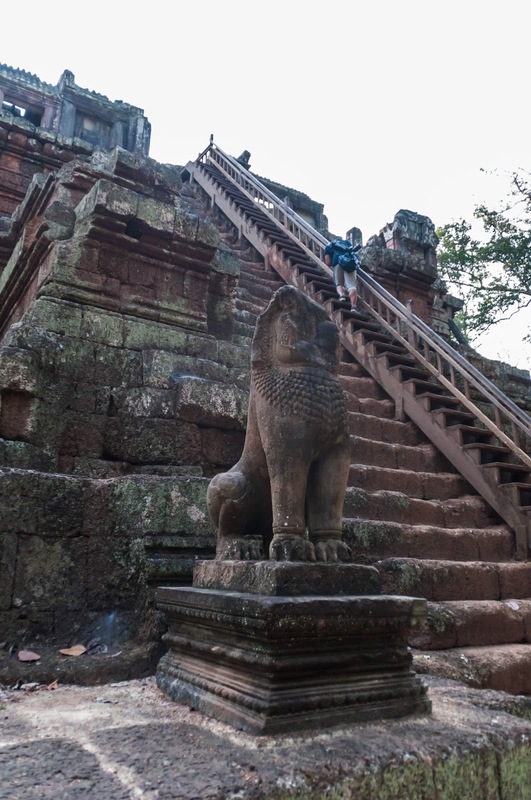 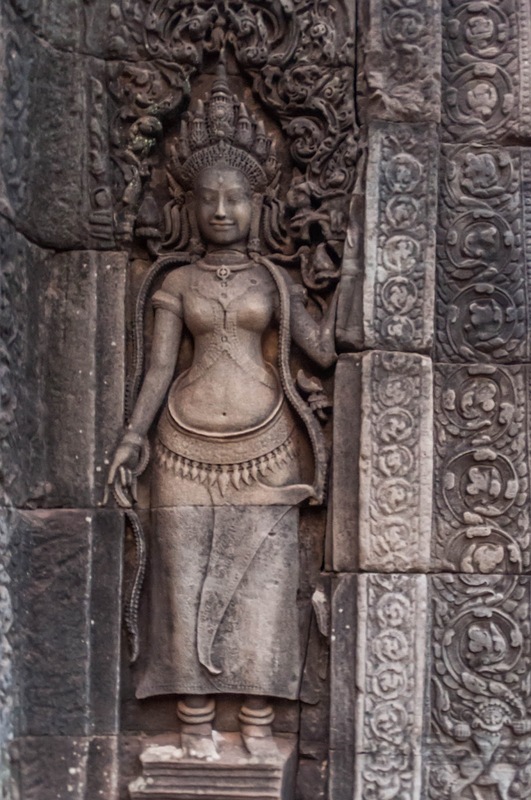 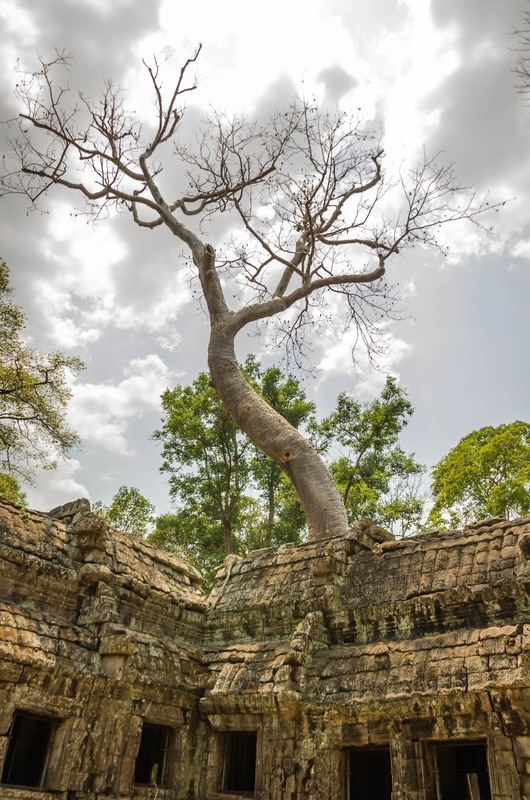 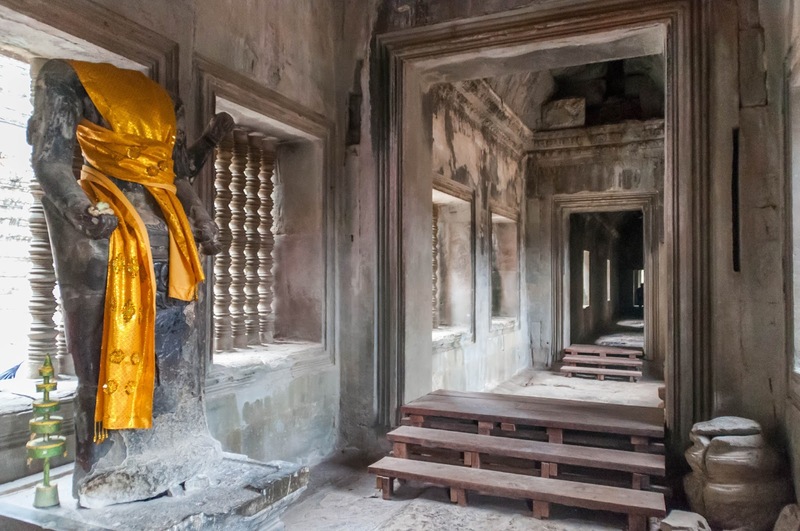 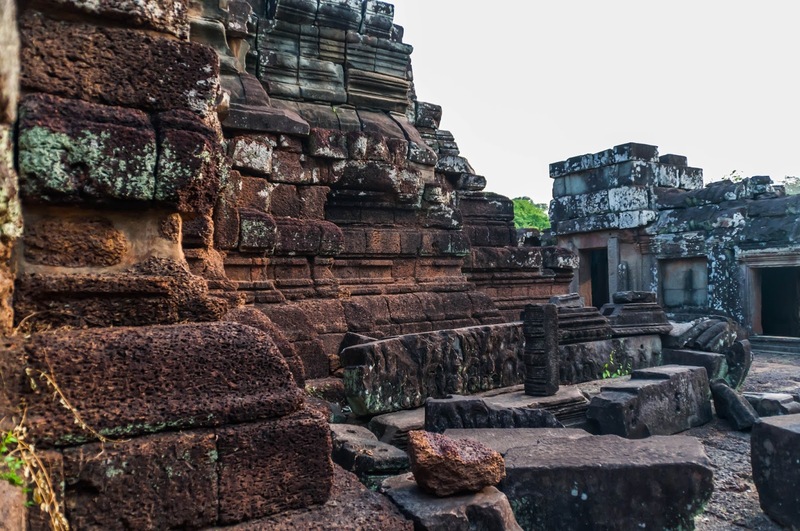 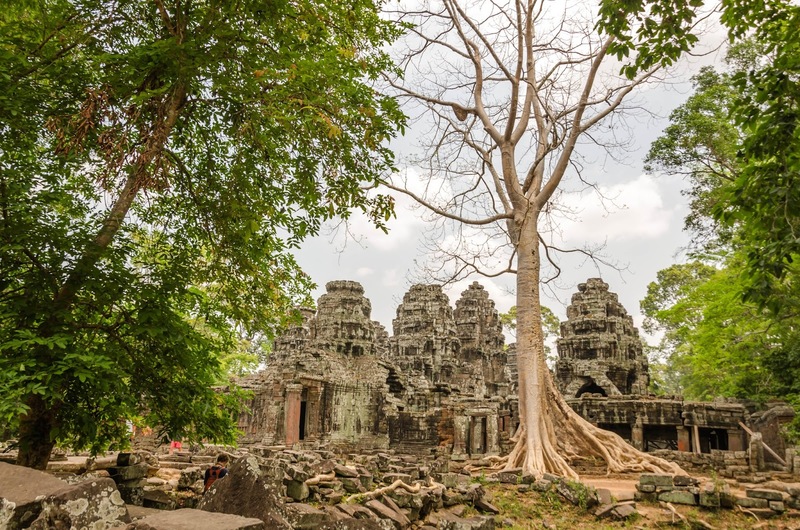 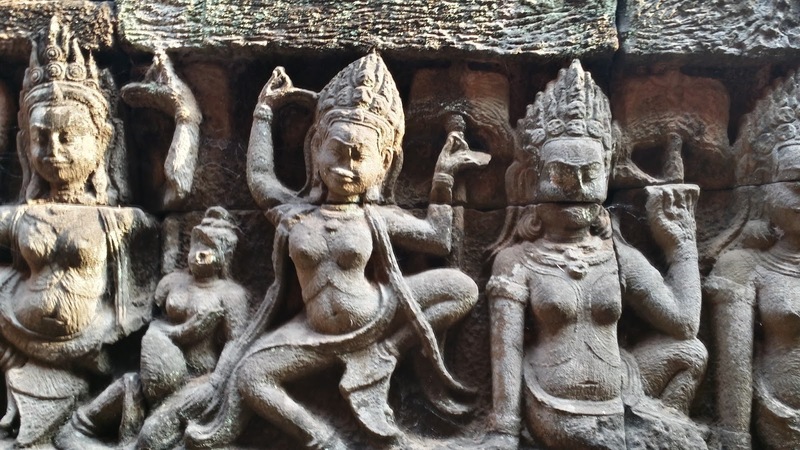 The Wayward Wanderer: Day 2 - Siem Reap: Who Raided the Tombs? 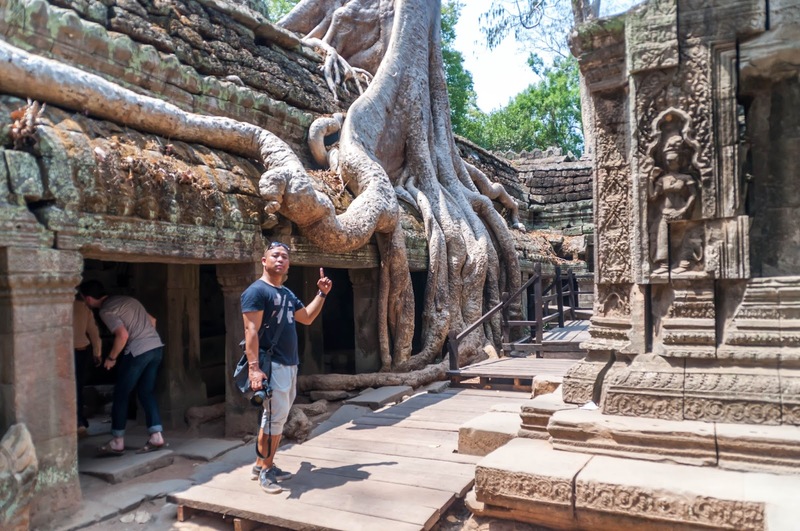 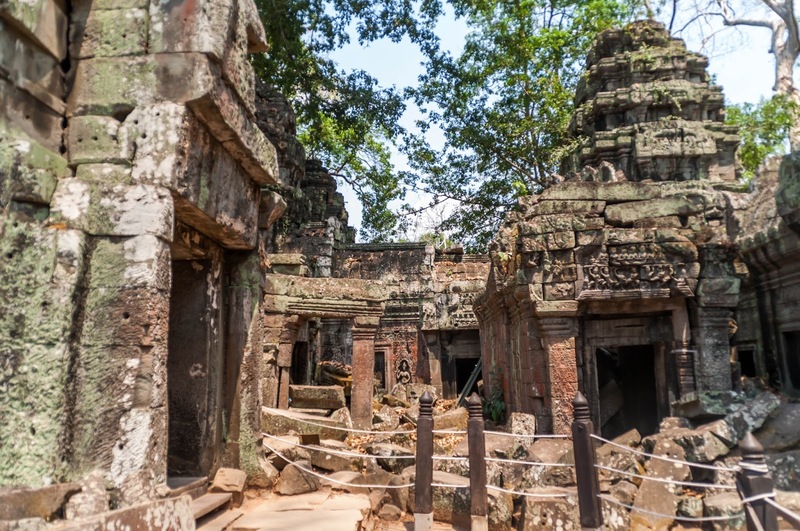 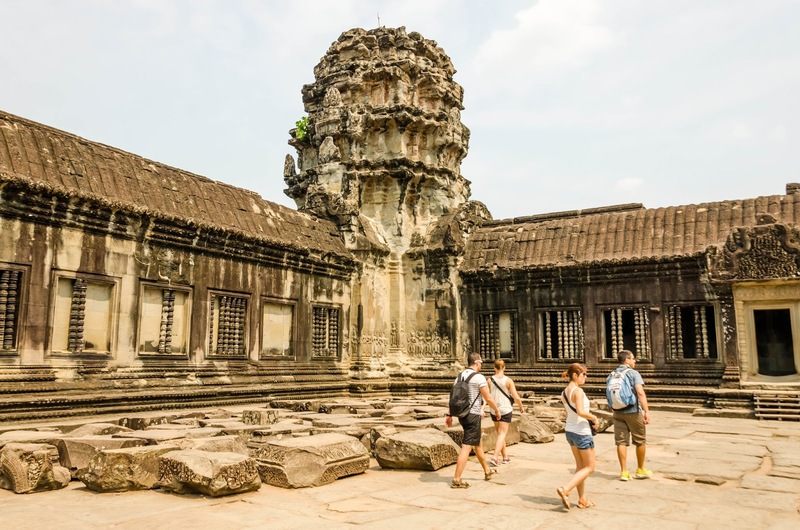 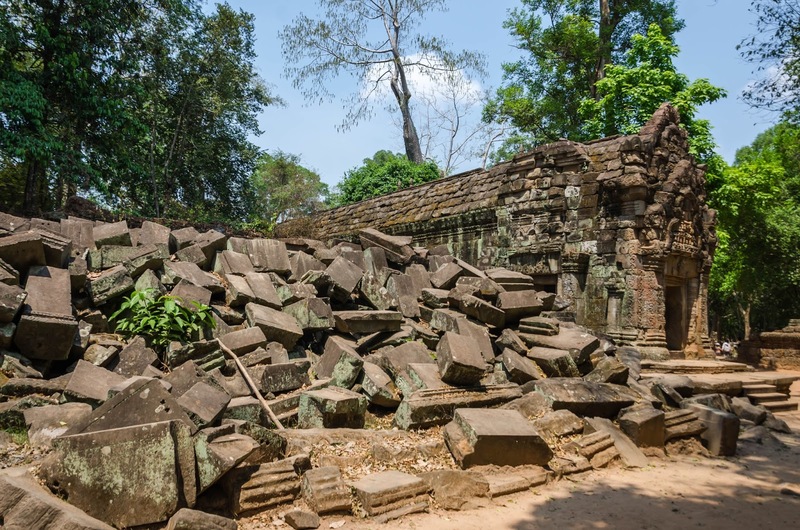 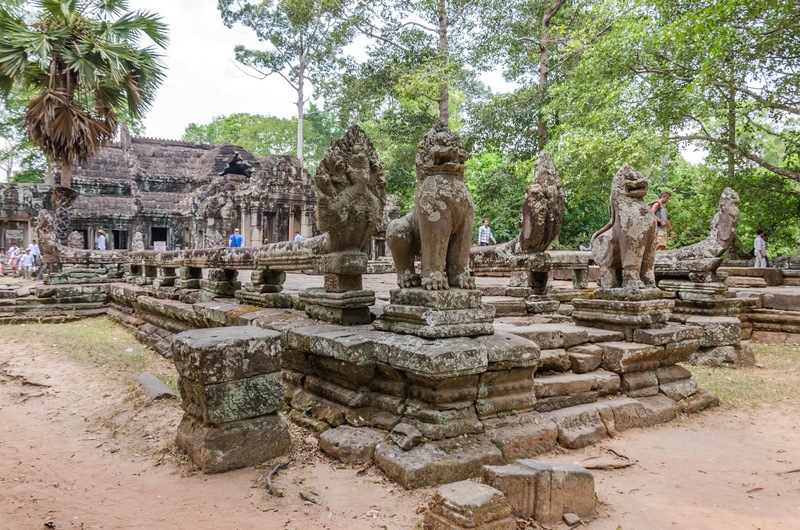 Day 2 - Siem Reap: Who Raided the Tombs? 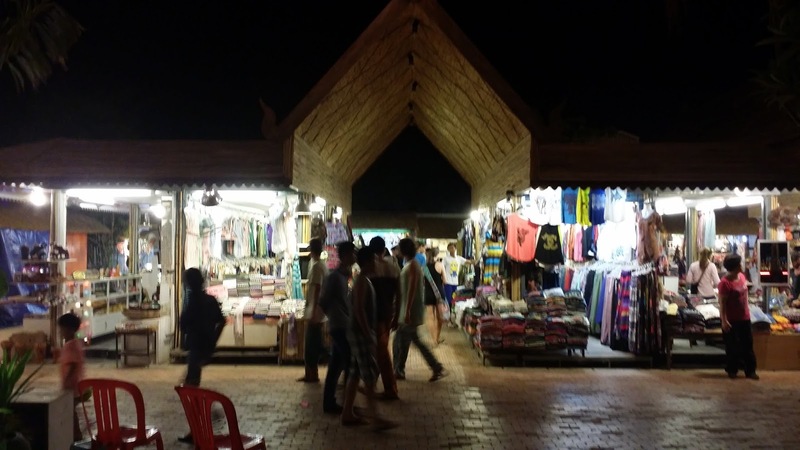 When I came out of the hotel in Siem Reap just before 5 a.m., the sky was still dark. 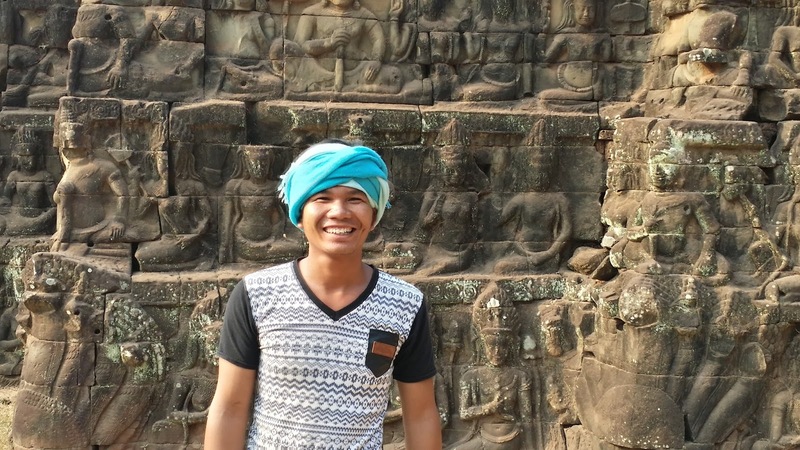 My friend was already going into the tuk-tuk for our early day tour of temple sightseeing, so I quickly followed suit. 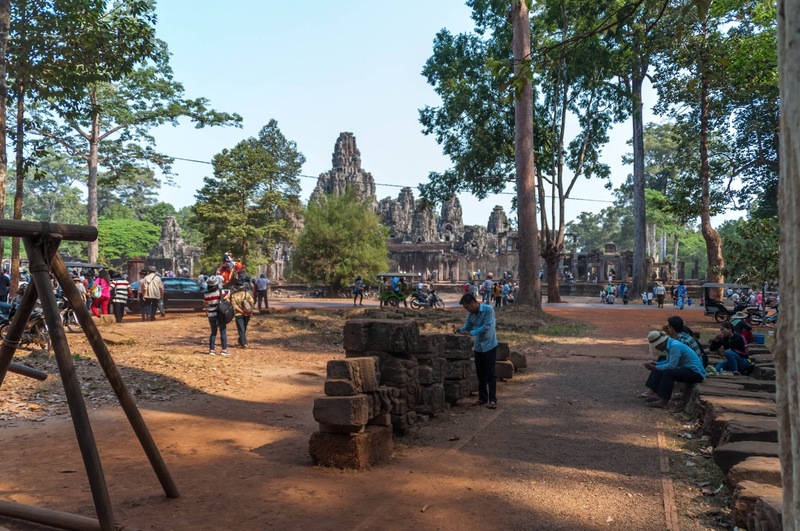 A few minutes later, however, when the driver stopped and asked us where we wanted to go, we then realised, that he wasn't the driver we arranged with the hotel. 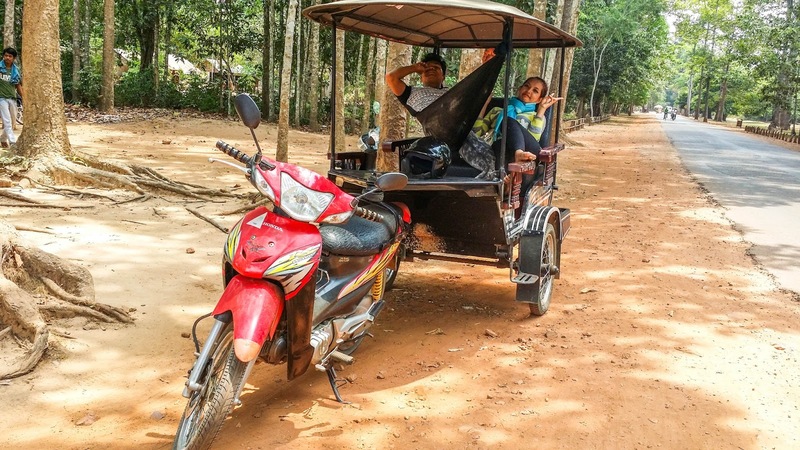 He turned out to be one of the many tuk-tuk drivers, who just drove by the hotel and of course, was looking for passengers. 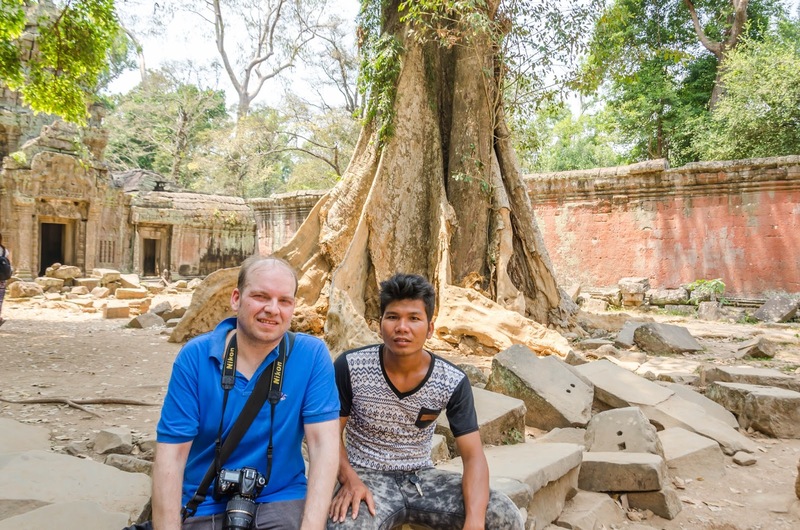 It happened that my friend was already waiting in front of the hotel and mistook the guy to be our driver that we've arranged to take us on tour. 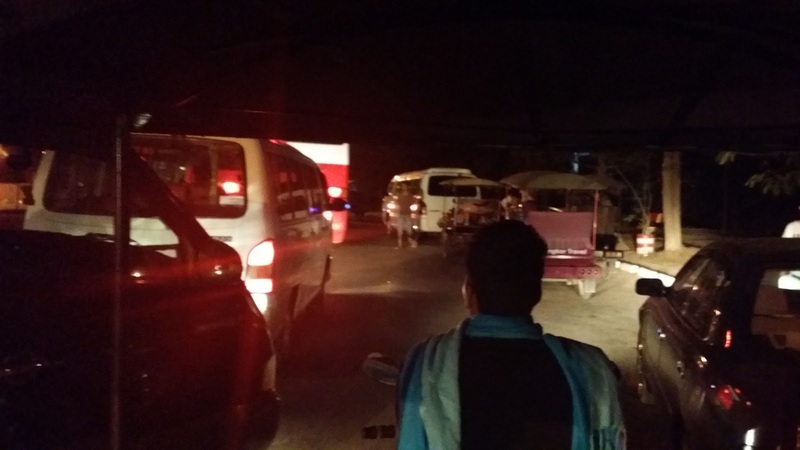 So we had to tell the very disappointed driver to bring us back to our hotel. 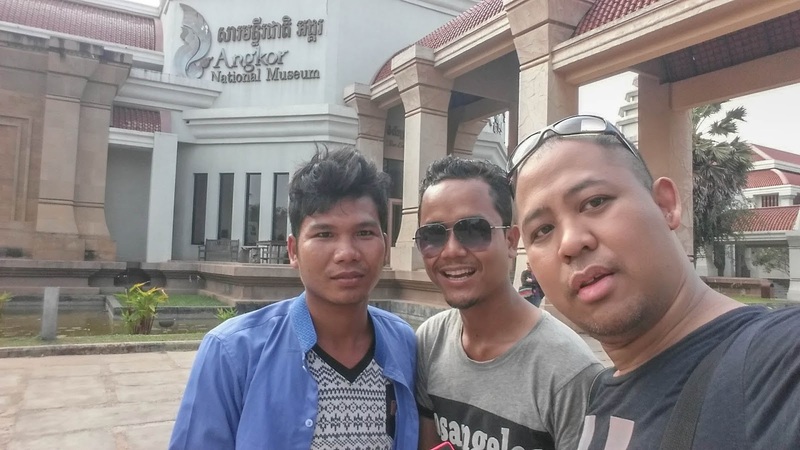 It cost us two dollars to be brought back where our driver- Ngoy, who already fetched us from the airport was waiting. 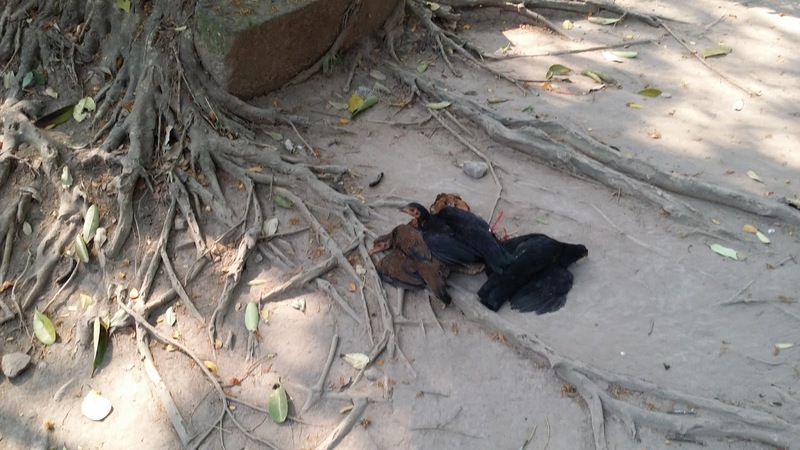 Well, things happen. 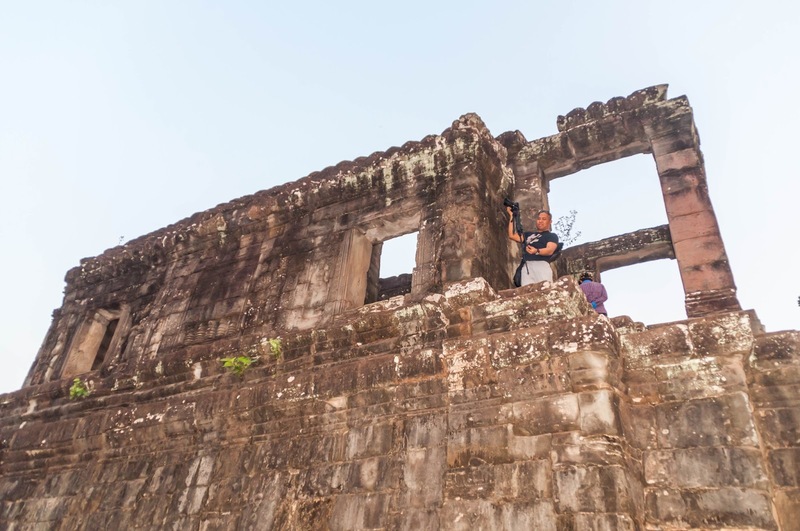 Our tour could finally begin! 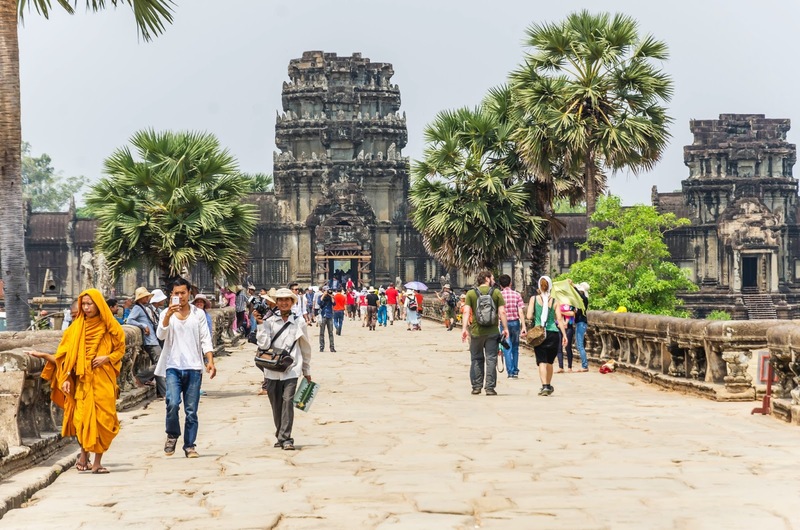 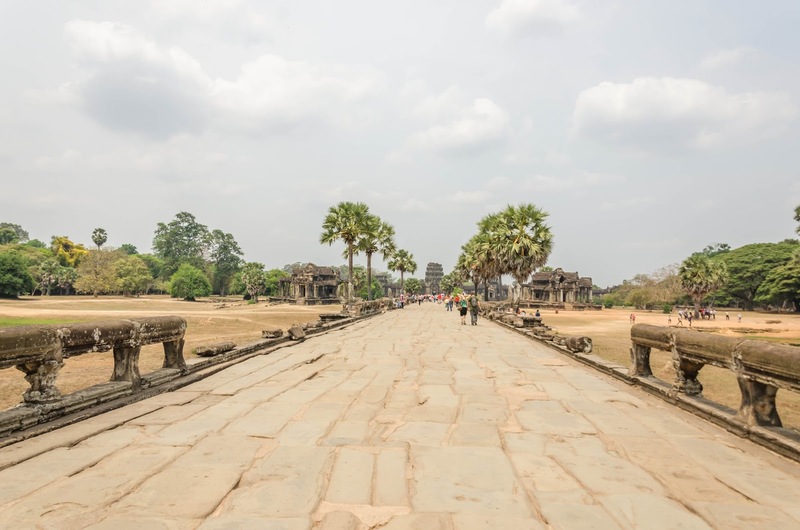 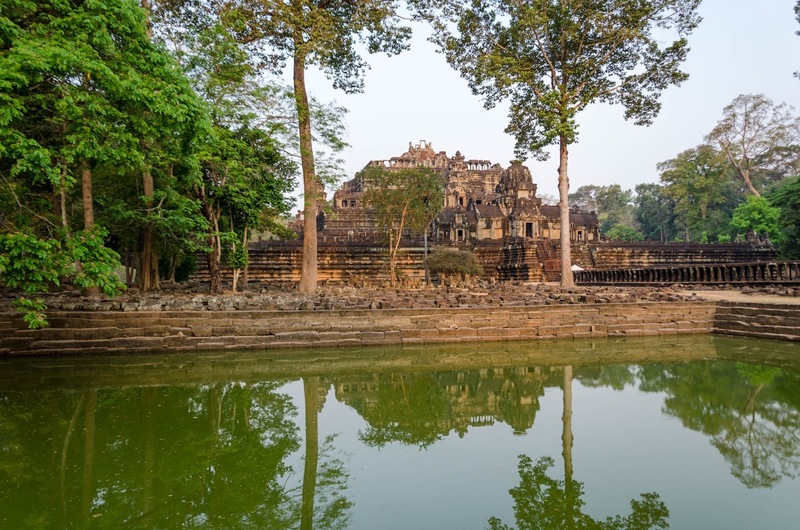 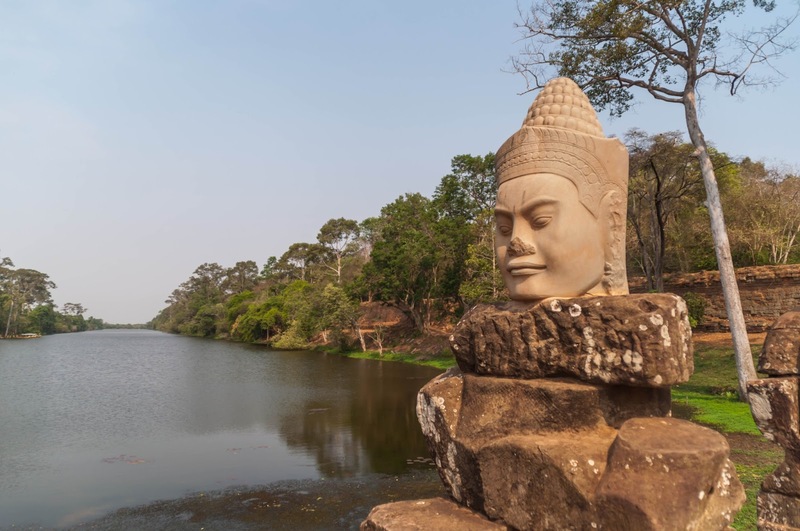 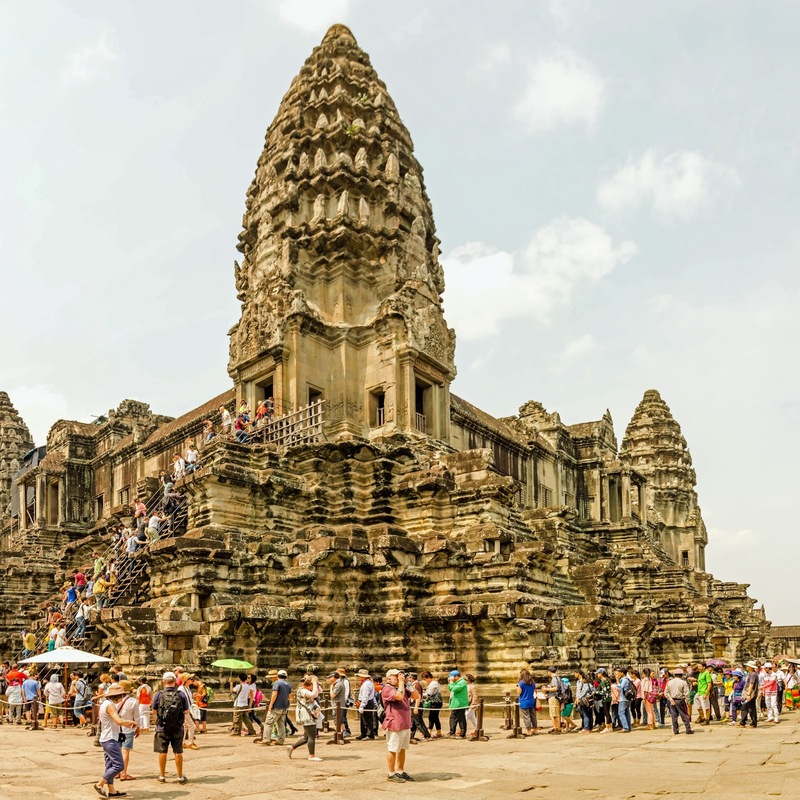 Angkor Wat and many other temples in the area are just a short drive away from Siem Reap, which makes them readily accessible. 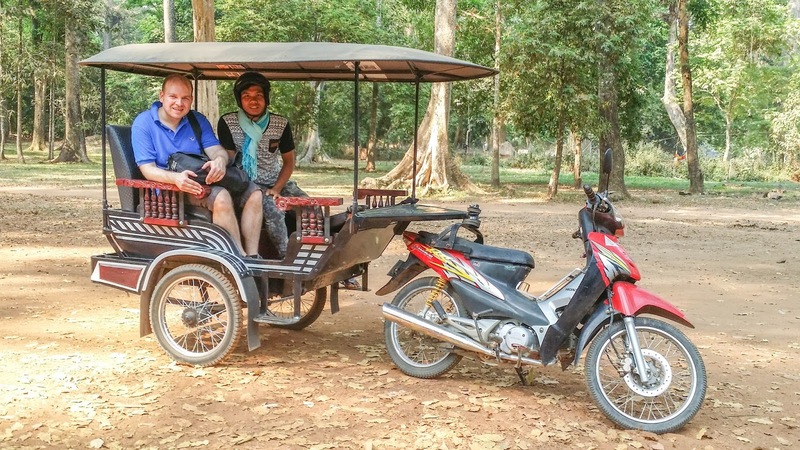 You can even rent a bike and head on there. 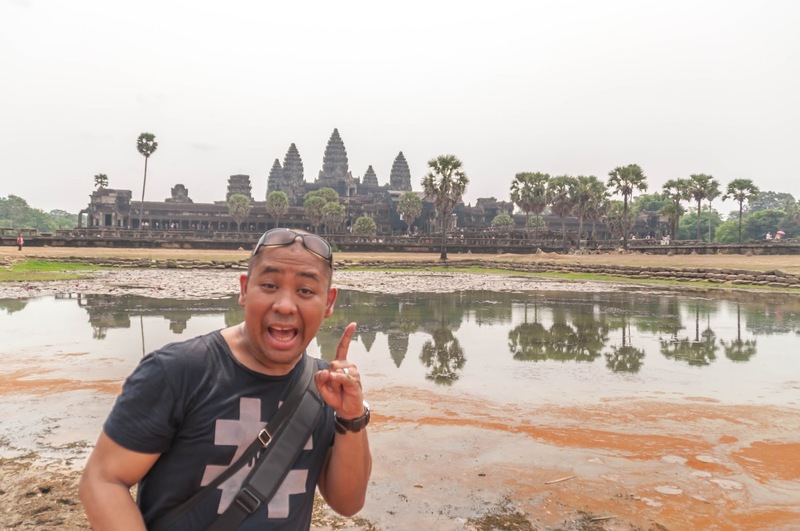 While you can book tours ahead, it was actually easy (and cheaper) just to ask the hotel for a reliable tuk-tuk driver, and Ngoy turned out to be very reliable and a safe driver and also a nice person. 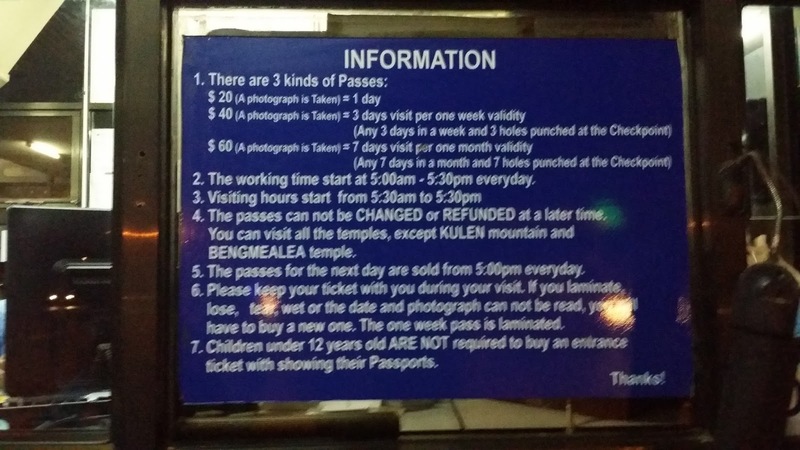 We first stopped at the ticket counter, nearby the entrance of the temple area, where we bought a three-day-pass for the temples, which cost about 40 US Dollars. 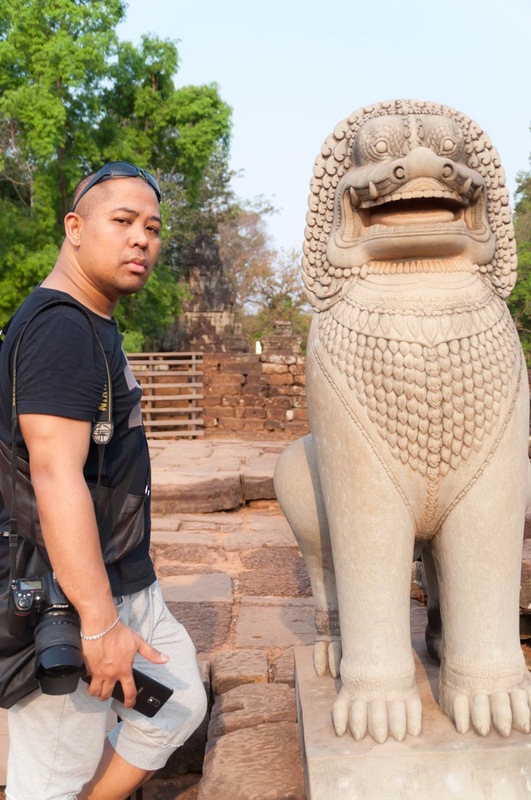 (US $ is the defacto currency, and you can pay for everything with it, you will be getting Riel also as a change). 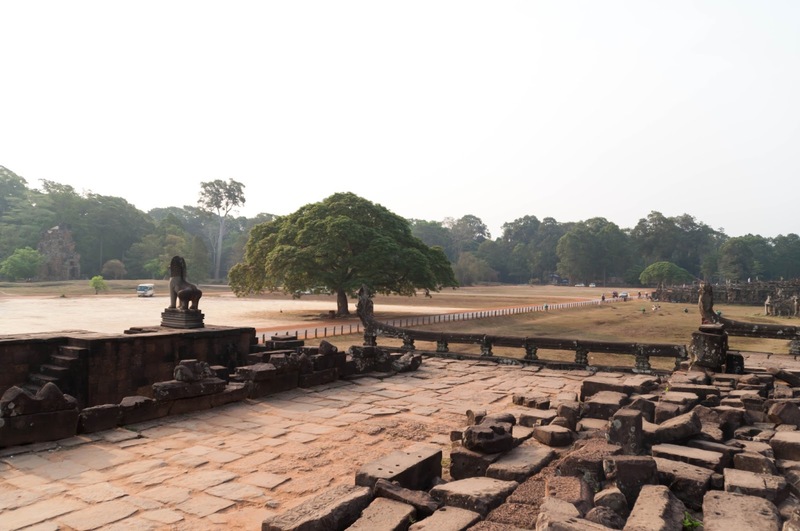 Then we soon arrived at Angkor Thom. 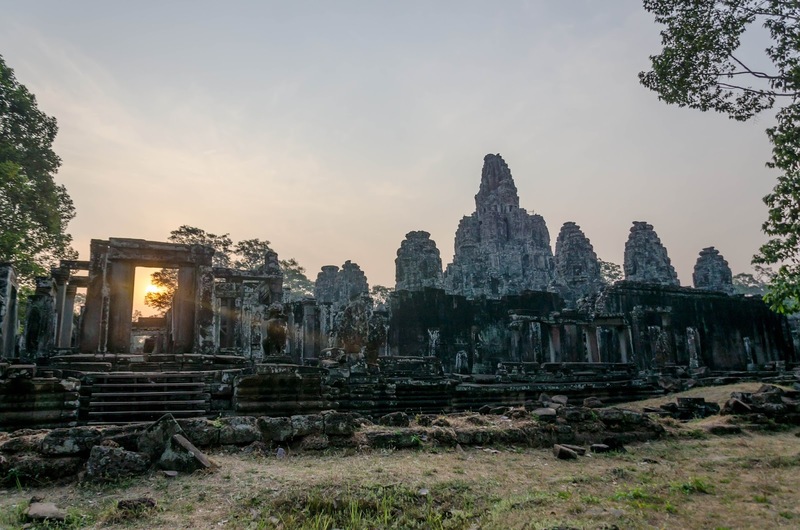 We had decided to spend the sunrise there, suspecting the crowds to be elsewhere. 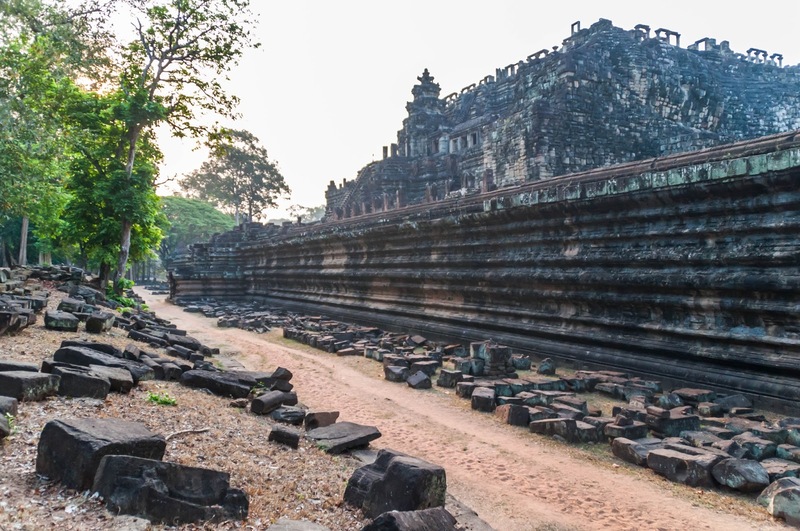 We've passed by the Angkor Wat where the crowd was already there waiting for the sunrise. 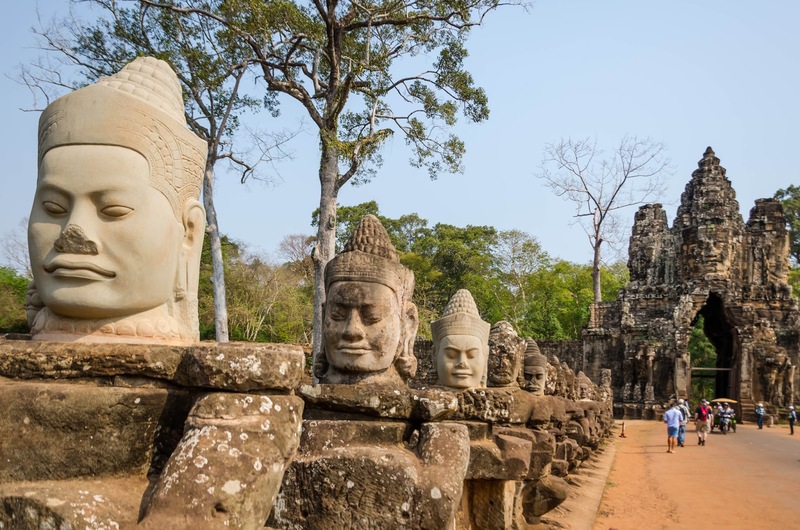 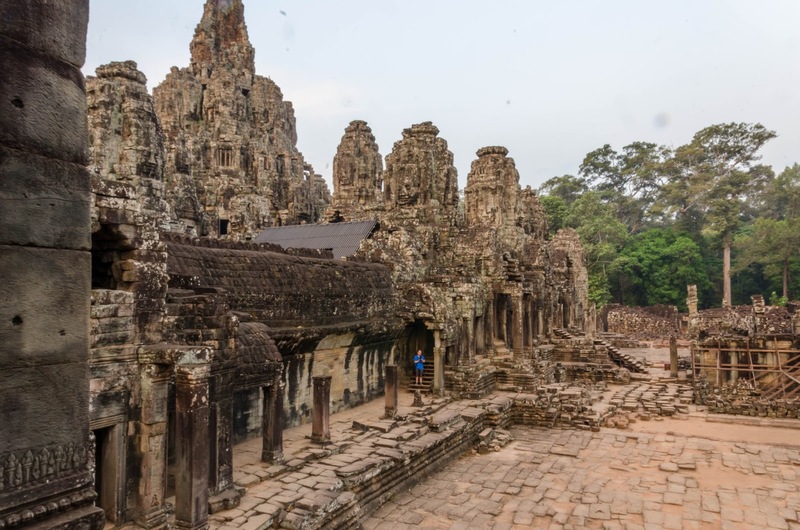 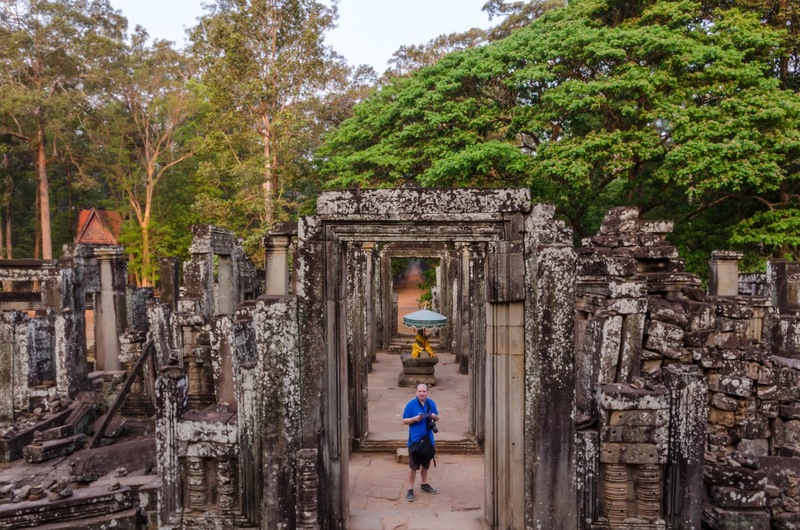 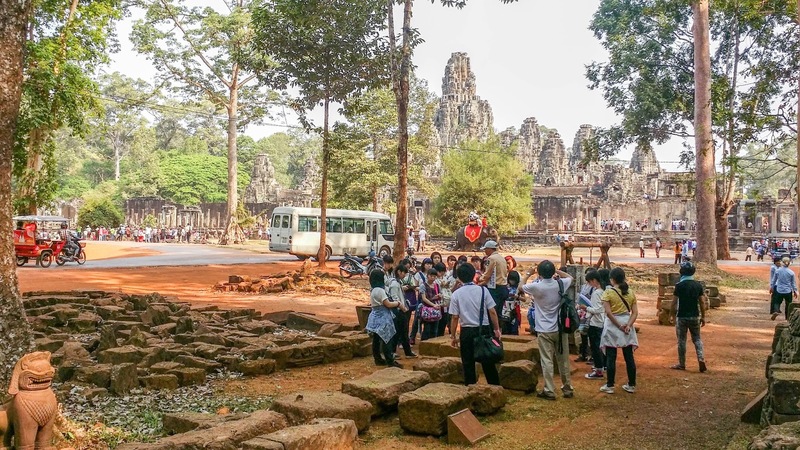 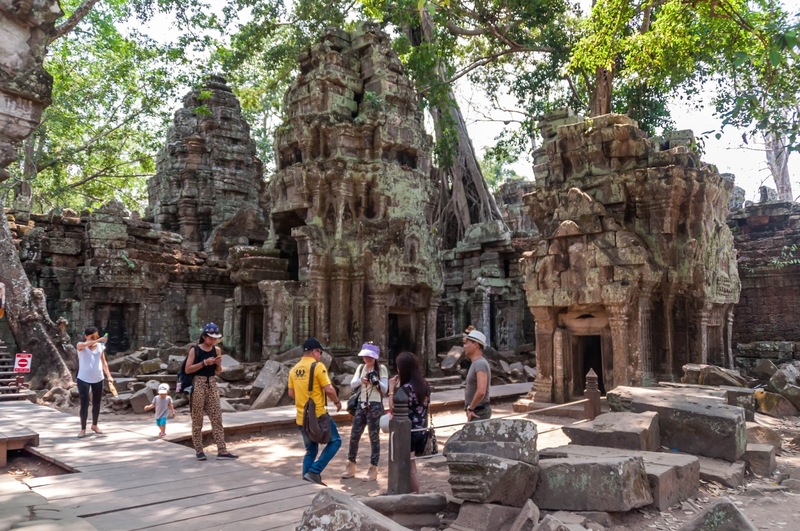 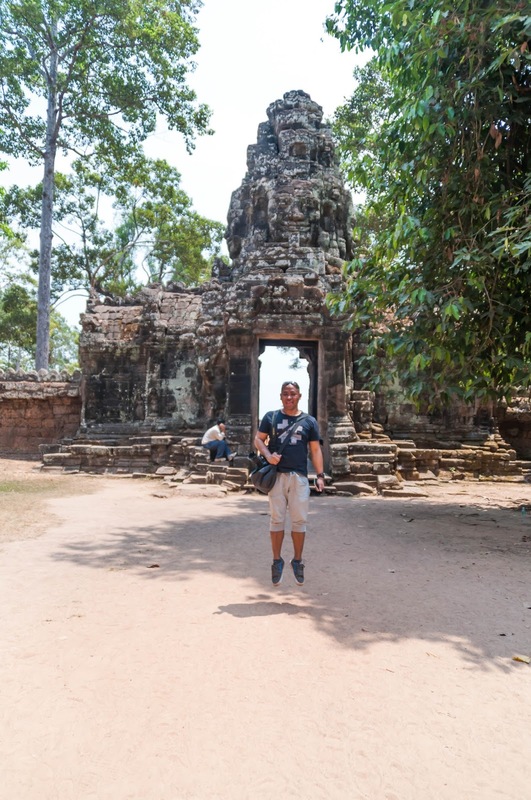 This turned out to be true - we had the Bayon Temple inside Angkor Thom nearly for ourselves except for a few children who were waiting for tourists! 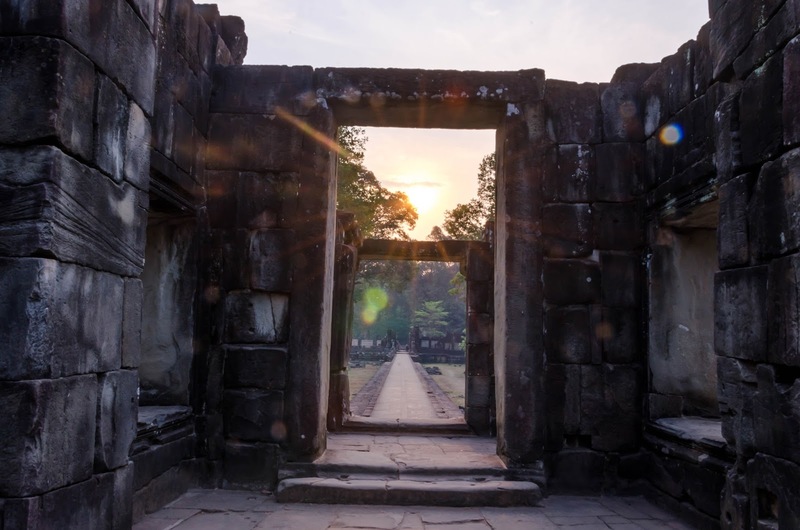 There may be better places for sunrise viewing. 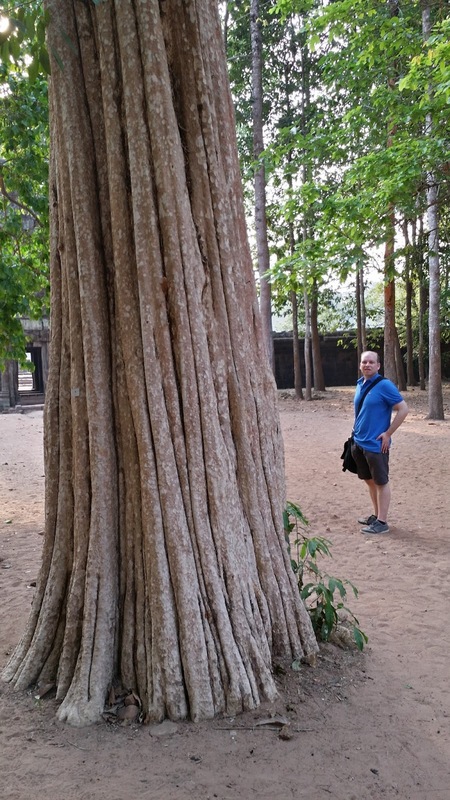 However, it was still fascinating. 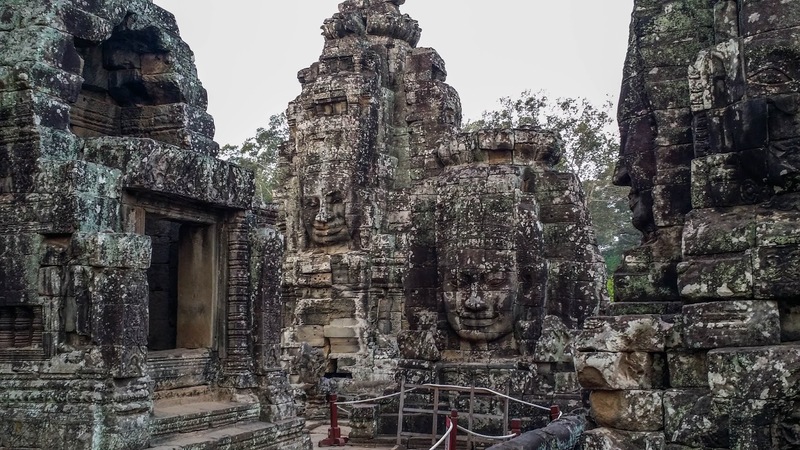 The temple complex is enormous, the giant stone faces were impressive, and there's a lot to see inside and outside. 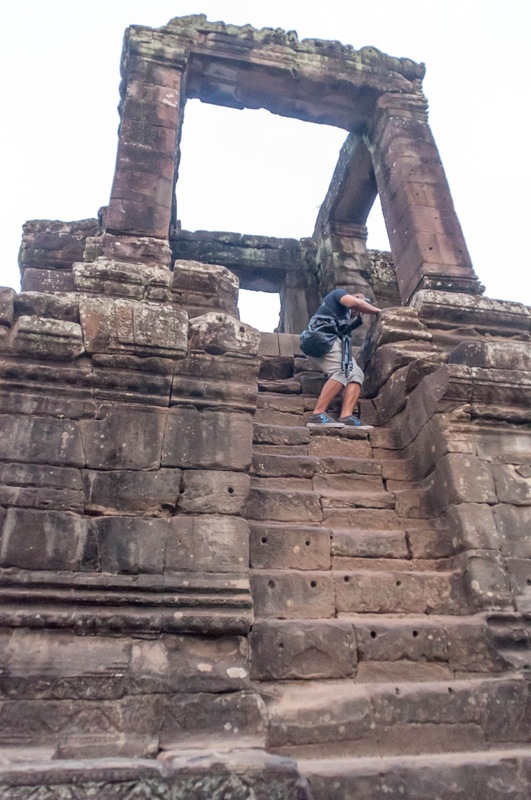 There was a boy who showed me around to earn a guide fee. 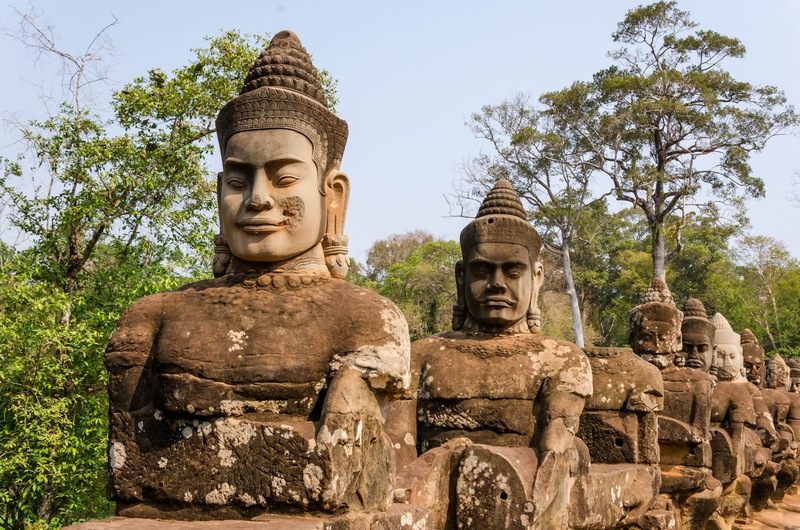 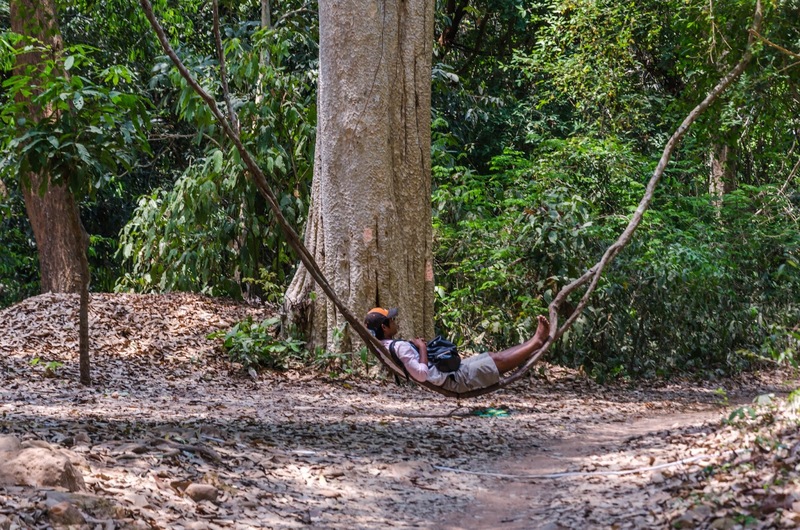 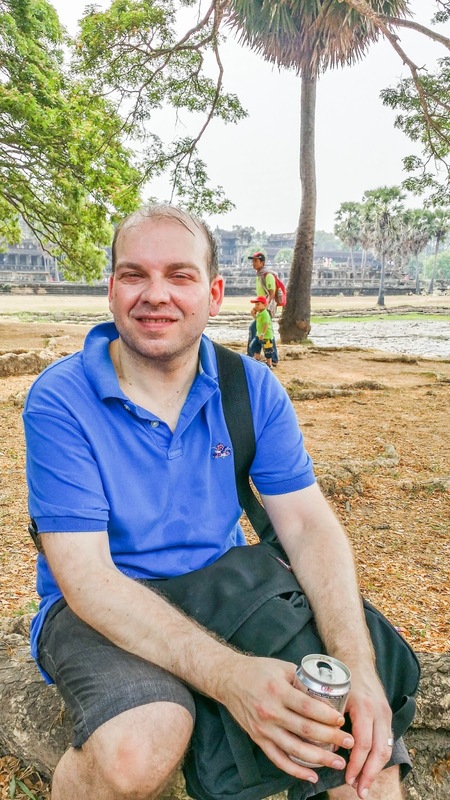 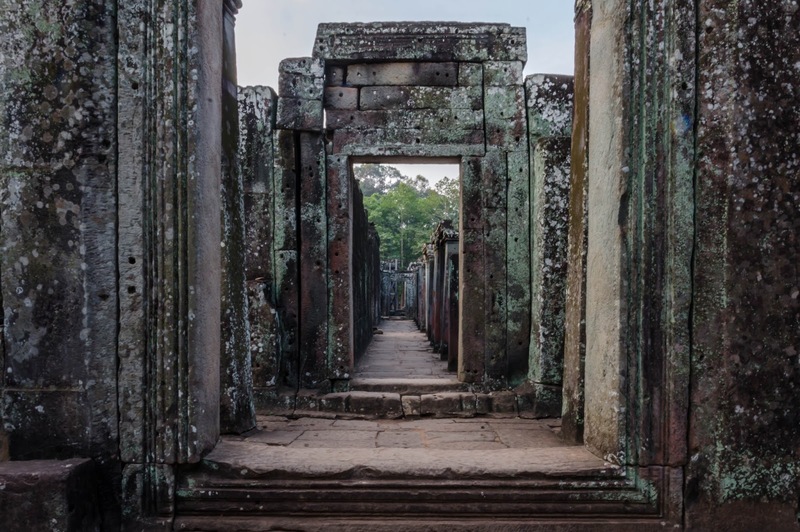 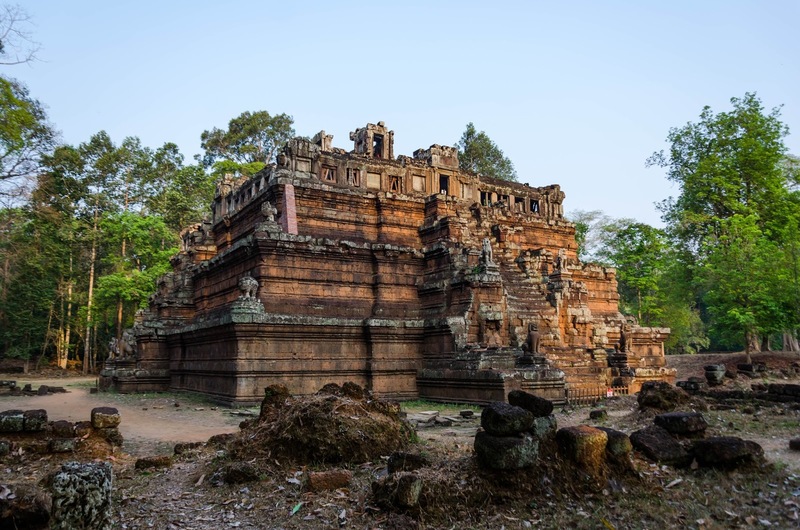 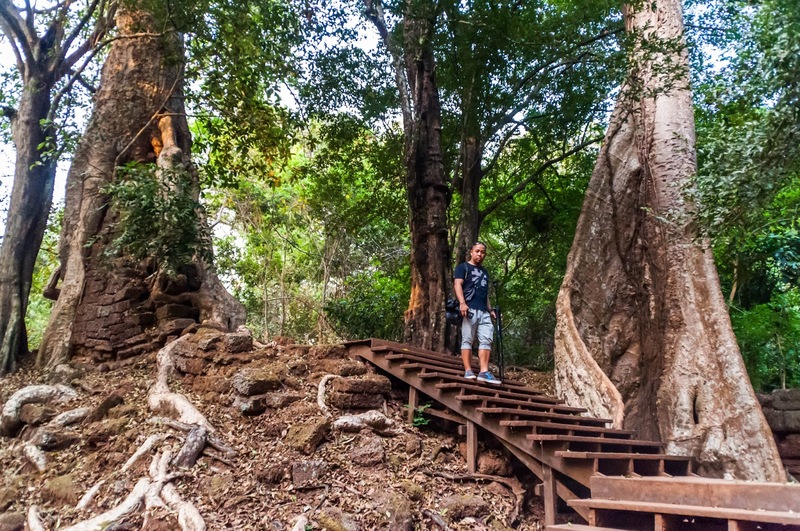 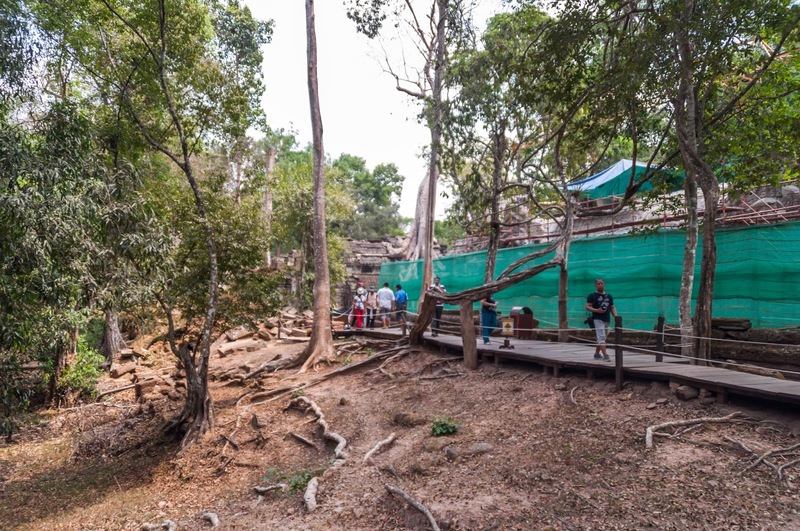 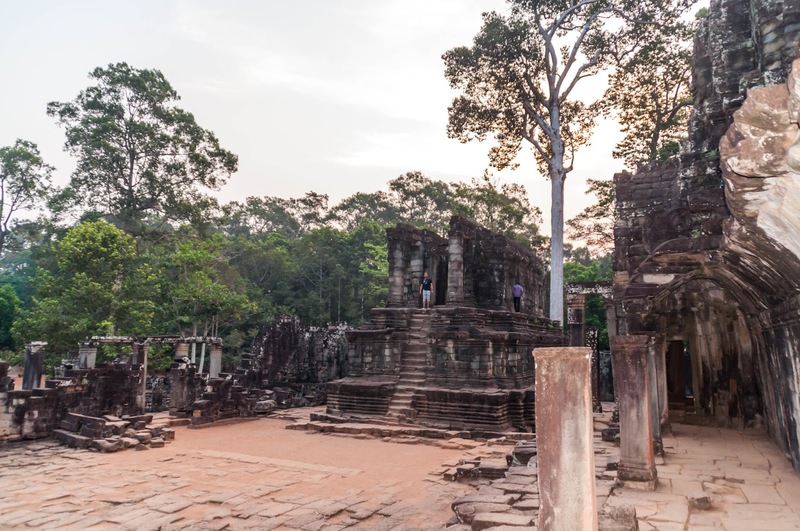 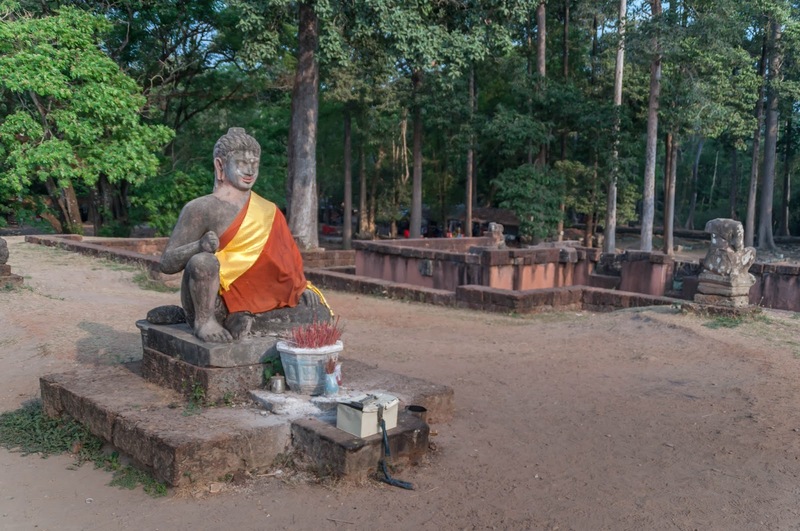 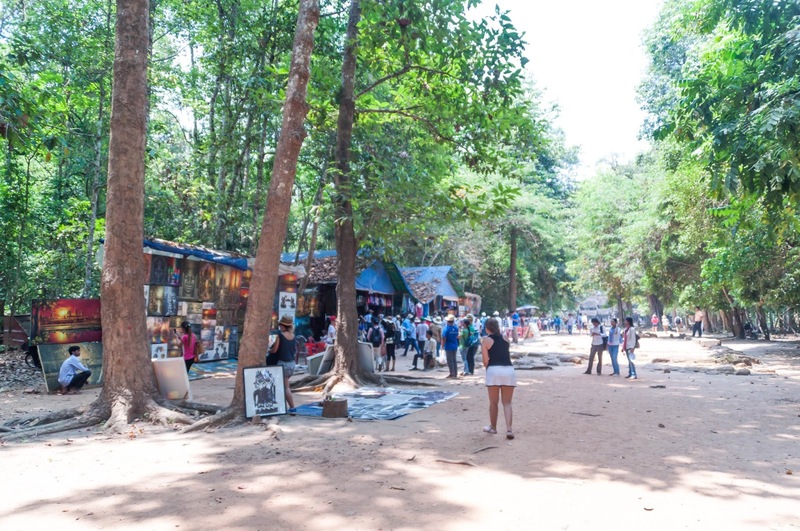 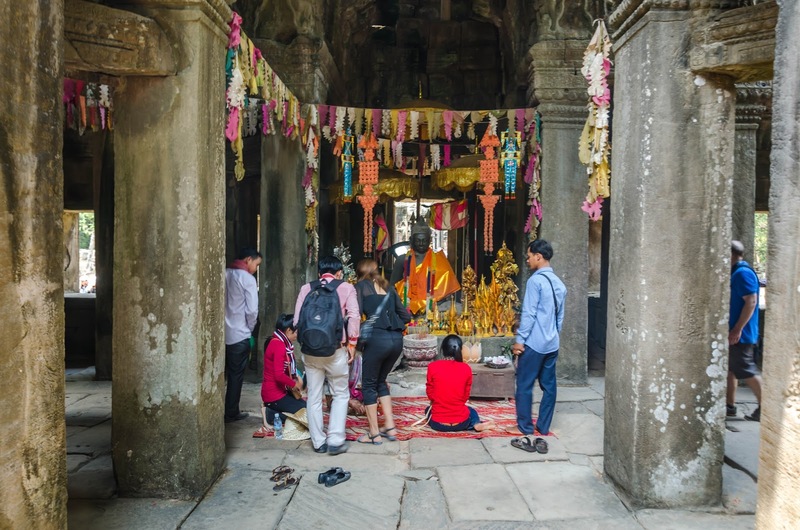 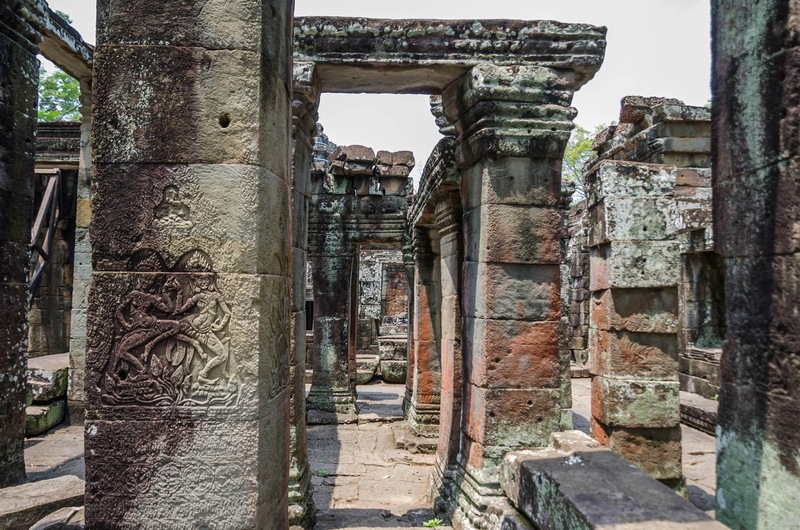 We had settled with our driver, that after dropping us off at the Bayon Temple, we would walk to the nearby Baphuon Temple, Phimeanakas Temple, the Terrace of Elephants and to meet him after exiting the Terrace of the Leper King. 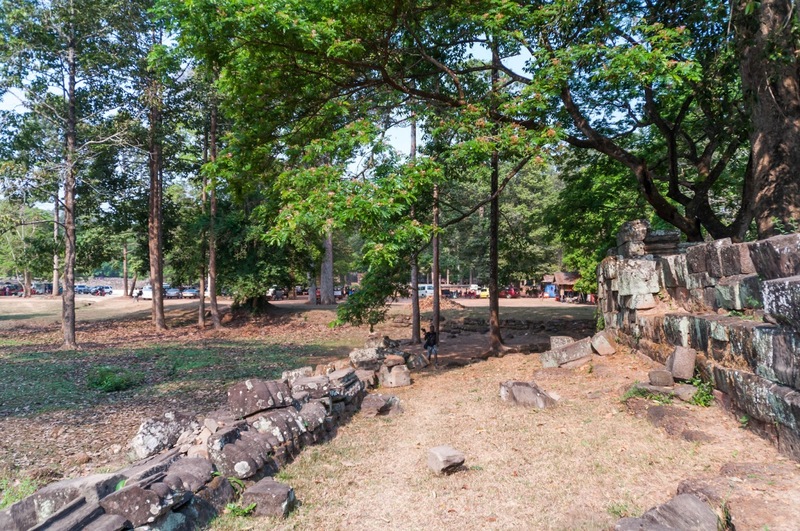 It was just a few minutes of walking until we arrived at the Baphuon Temple. 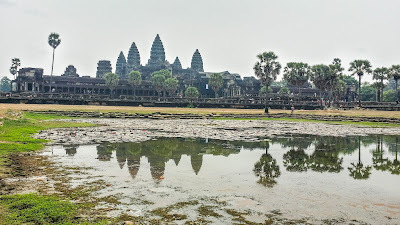 The temple was also massive but unfortunately closed for visitors. 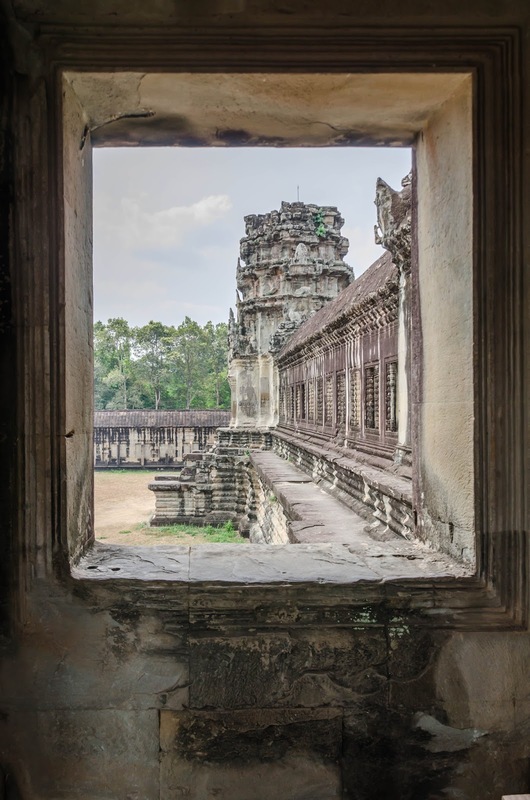 A view of the outside, however, was worth the visit. 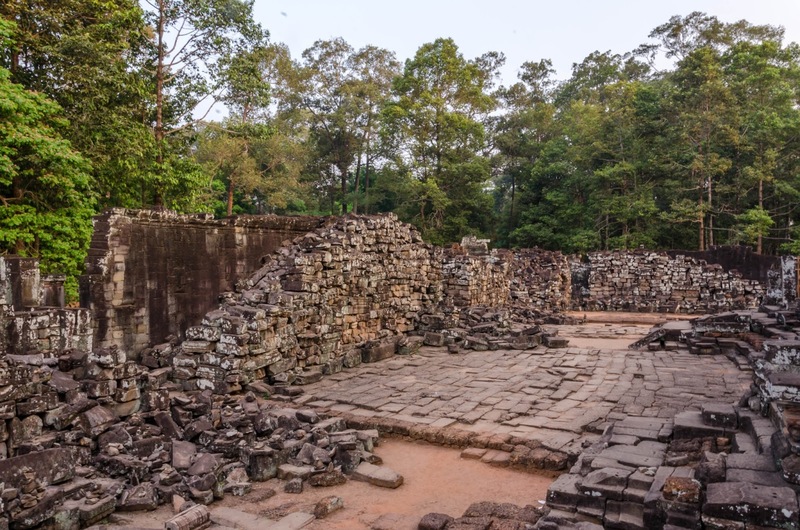 From the Baphuon Temple, we followed the signs to the Phimeanakas Temple, which looks like an ancient pyramid. 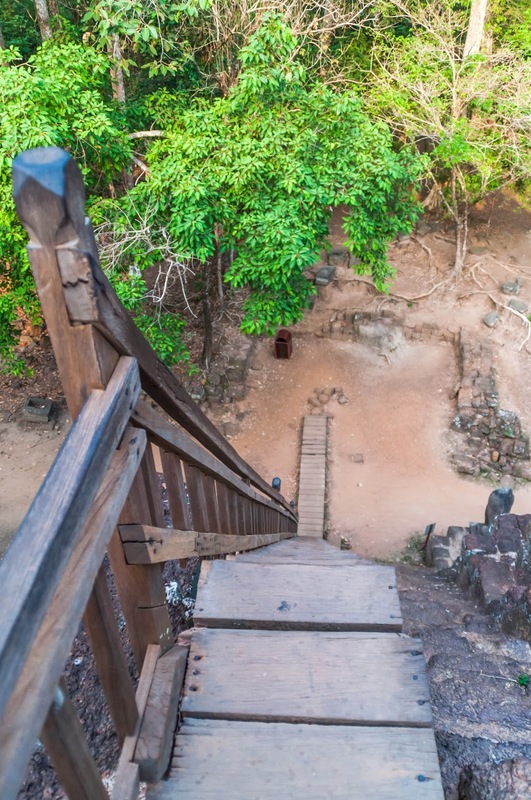 It was great - I always had wanted to see a pyramid, and there we could even follow the stairs to the top! 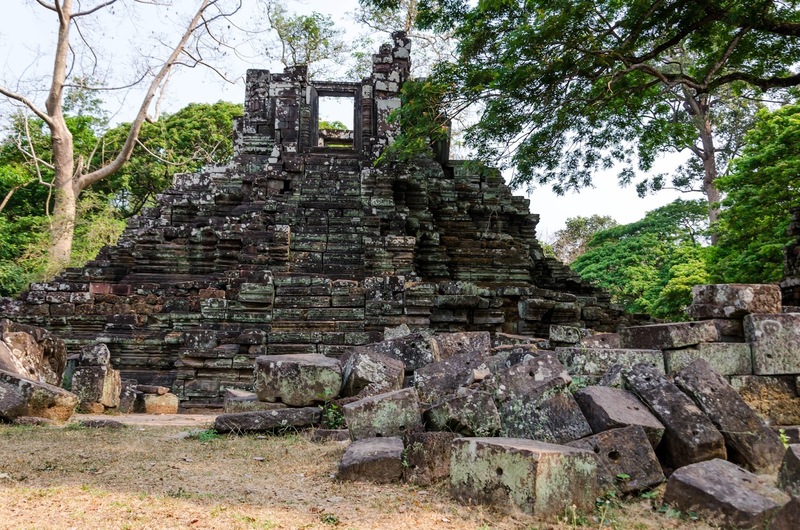 It was still very early in the morning, and we had the pyramid in the woods primarily for ourselves. 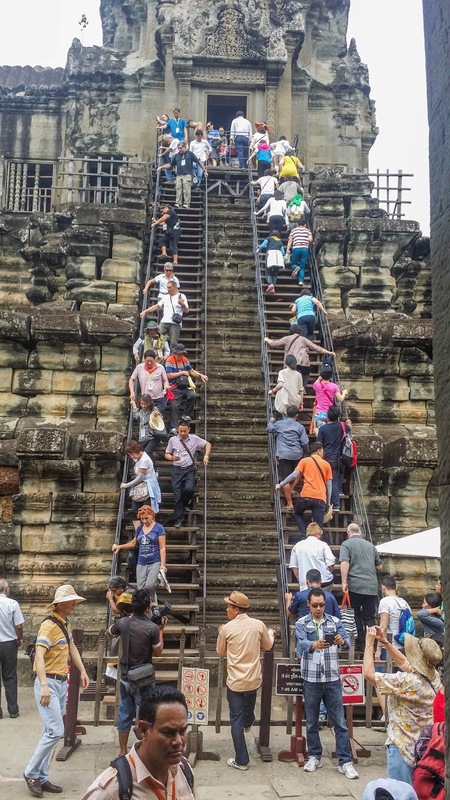 That was especially good, considering my acrophobia and the steep stairs, which are probably more stressful when it is crowded. 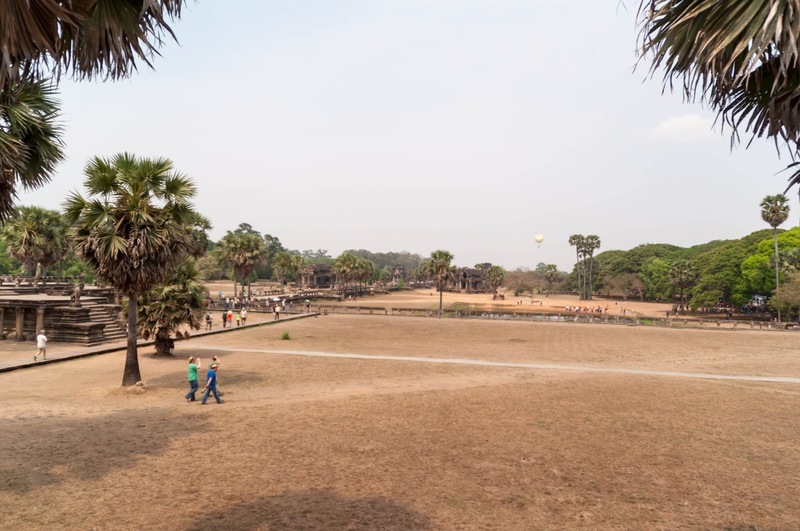 From the pyramid, we continued to the Terrace of Elephants, which is a massive platform with elephant sculptures. 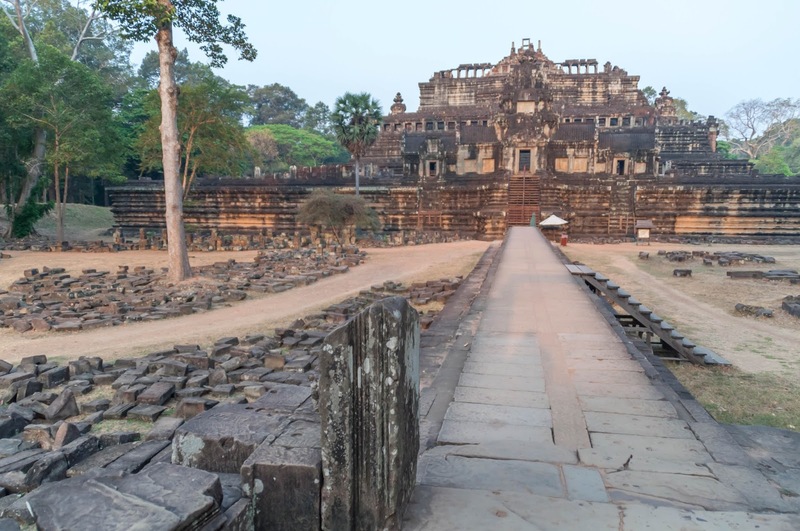 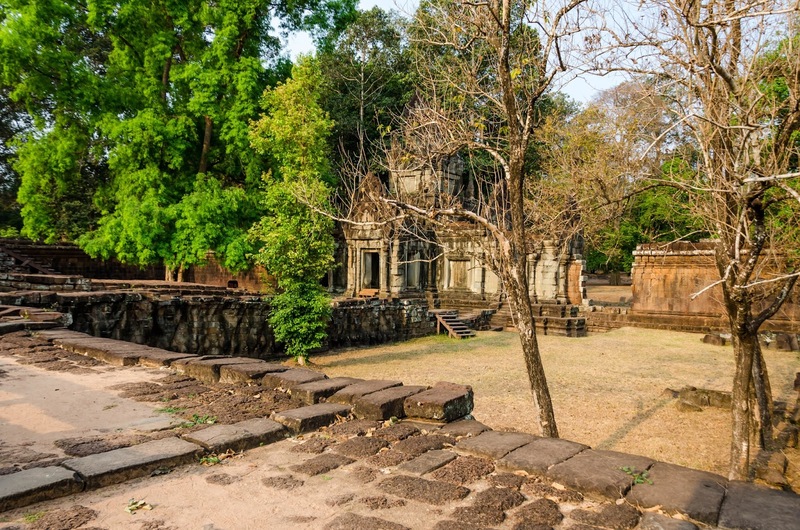 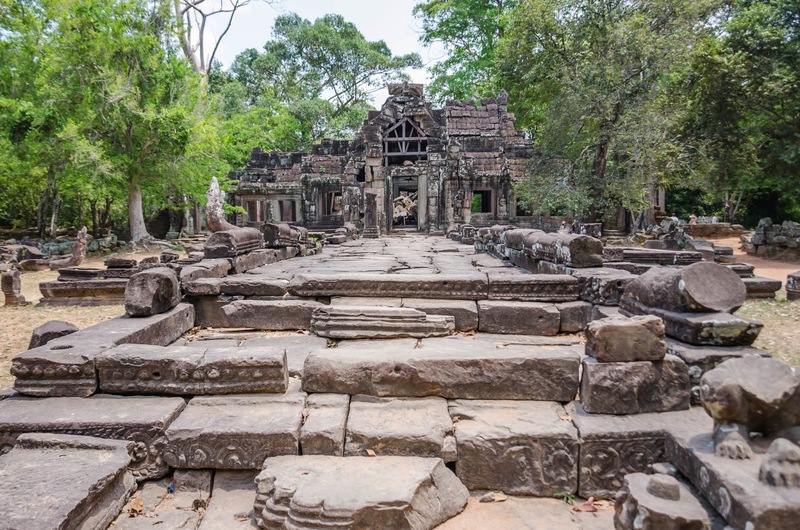 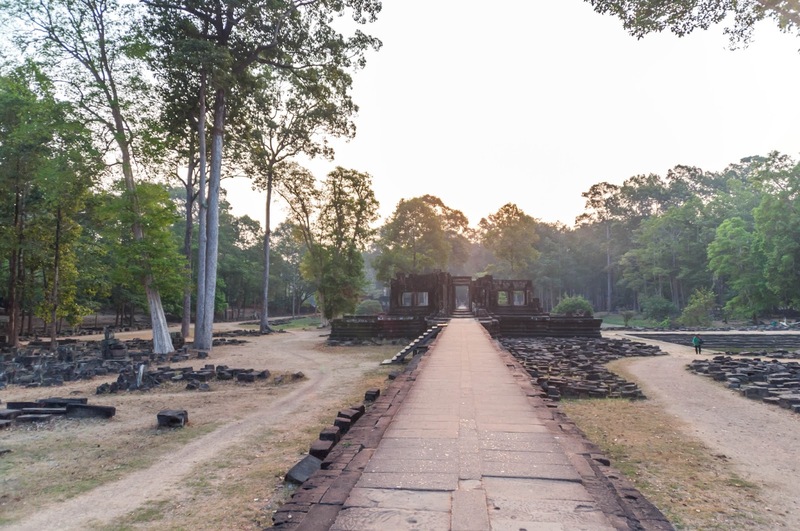 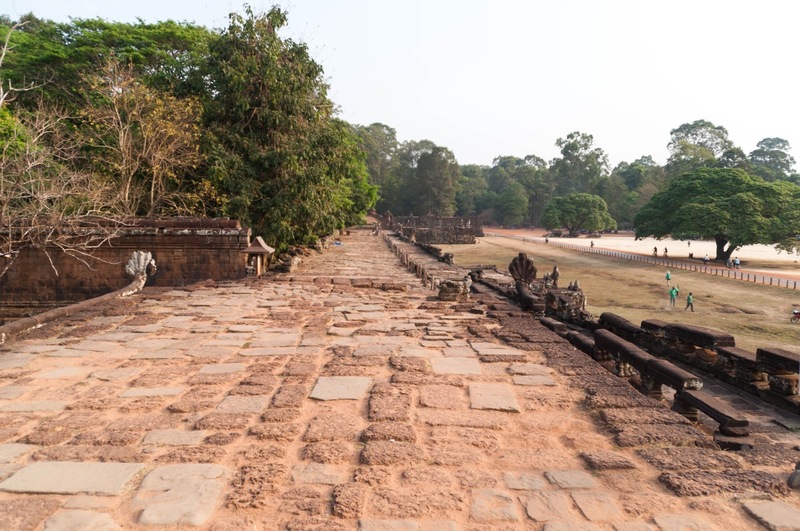 It leads to the Terrace of the Leper King, which might have been a royal cremation platform and shows many little statues. 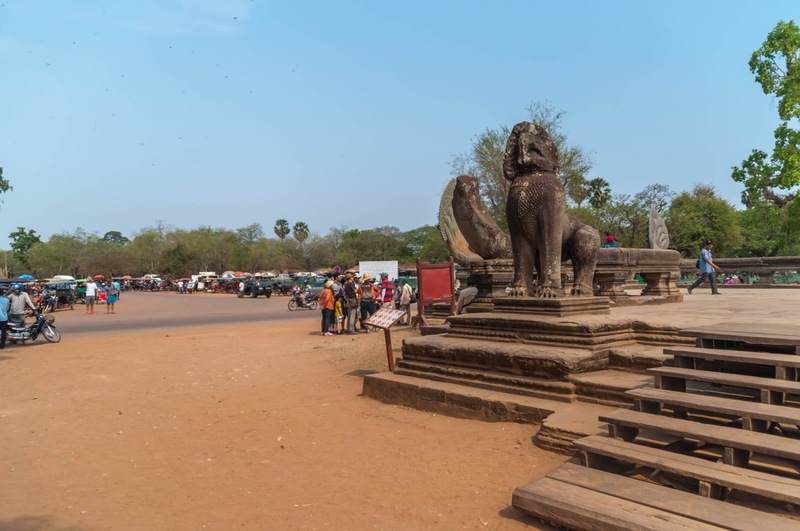 At the Terrace of the Leper King our driver Ngoy already awaited us, and we went to the eatery area opposite the terrace, where we got chicken, rice, fries for breakfast and of course some protection against sunburn. 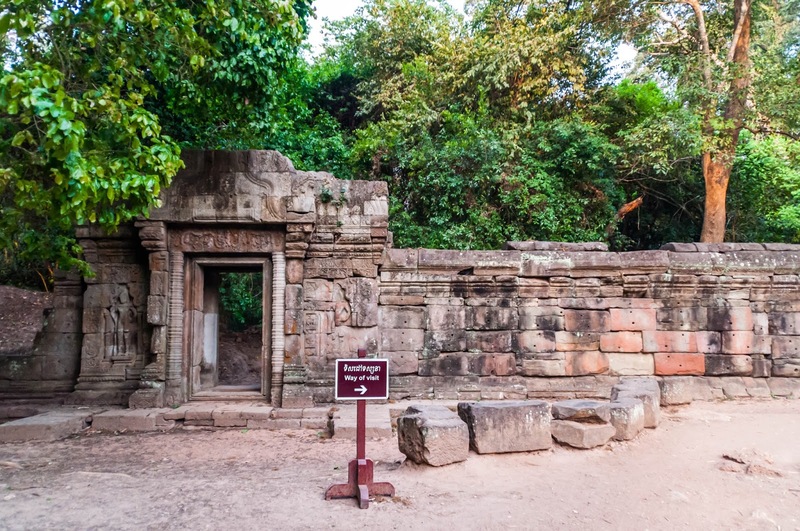 After this break, we walked a few steps to some nearby temples next to the restaurant area and opposite the Elephant Terrace - North Khleang. 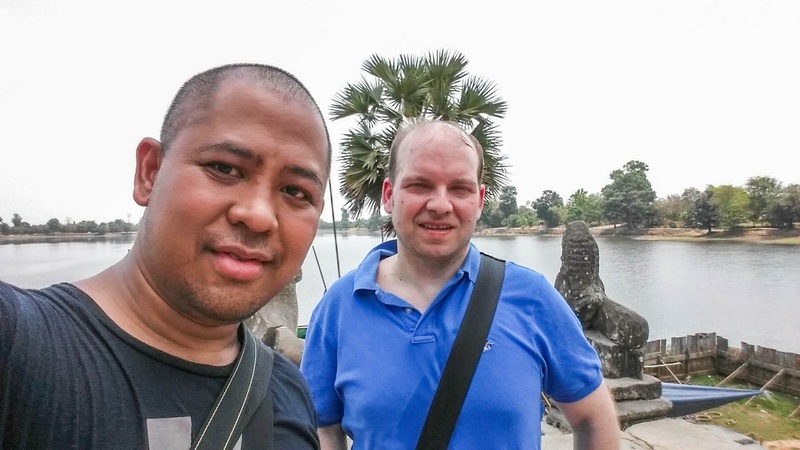 Finally, we continued by tuk-tuk to the highlight of the temple area - Angkor Wat. 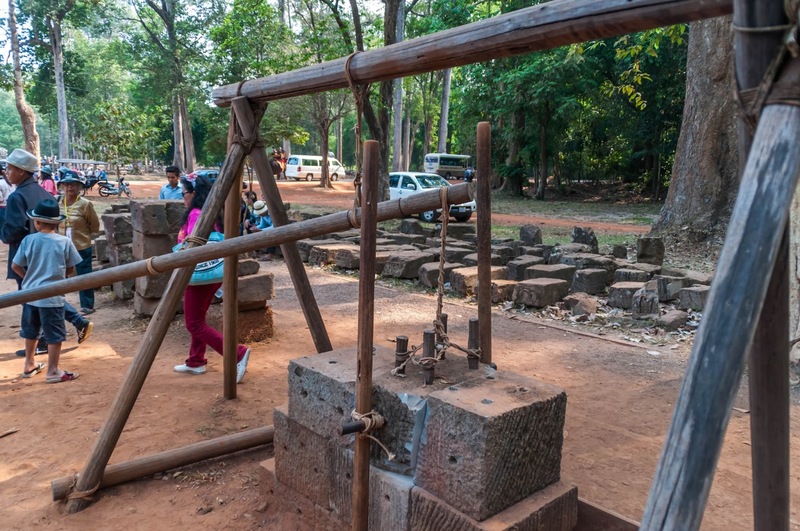 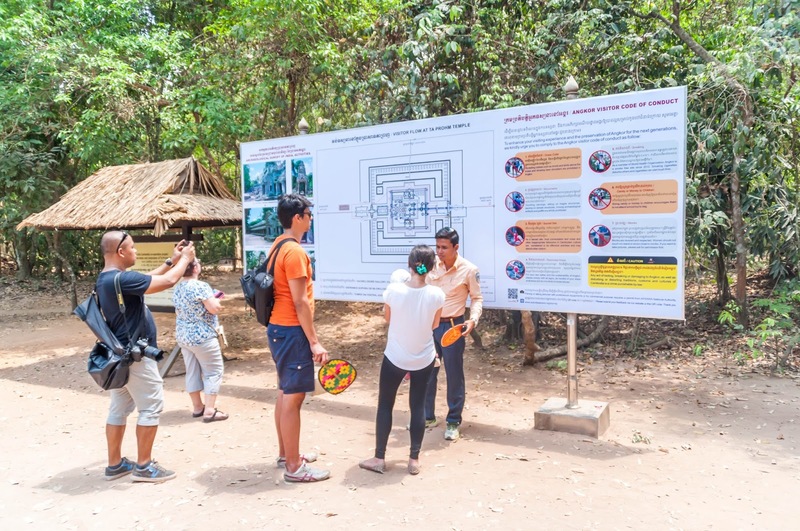 After a short stop at an information point, where the technique to lift the stones and build the temples is shown and another one at the South Gate of Angkor Thom, we soon arrived. 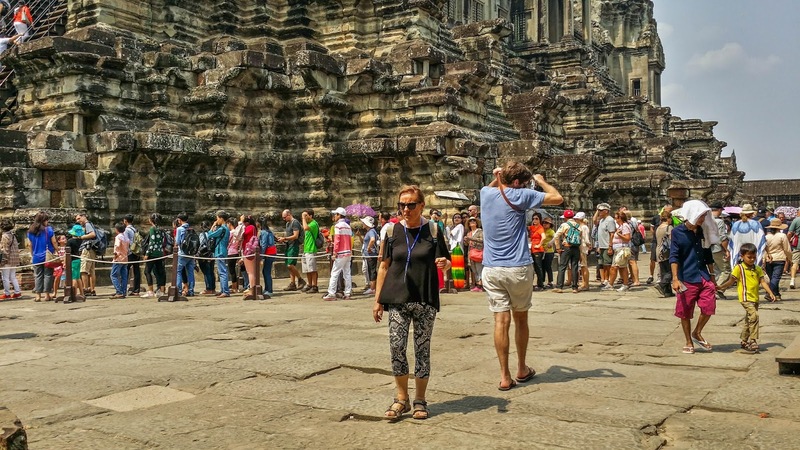 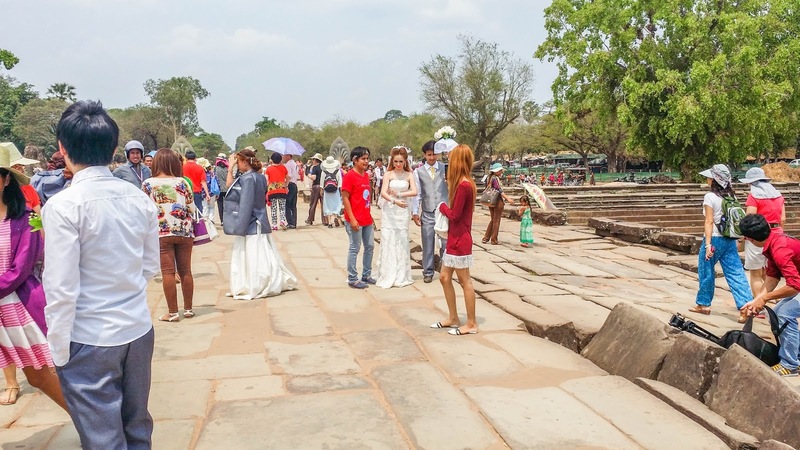 At Angkor Wat, there were already many people and the area is quite busy. Still, the look of the most significant religious monument in the world is majestic. 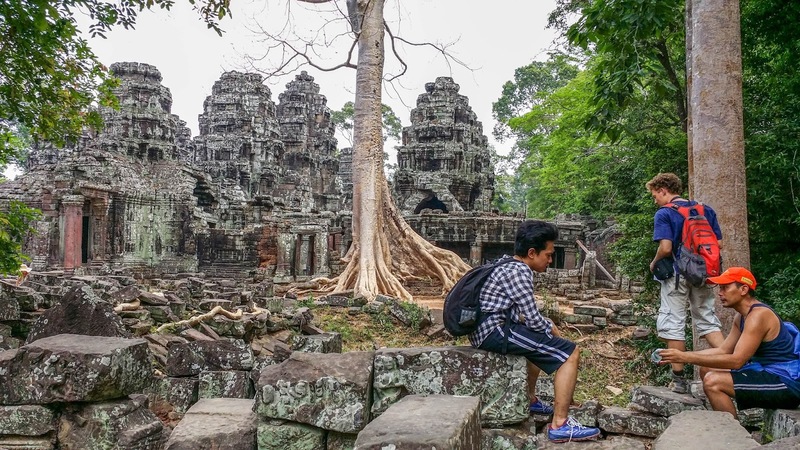 The complex is enormous, and we took our time to look around and just sit and relax. 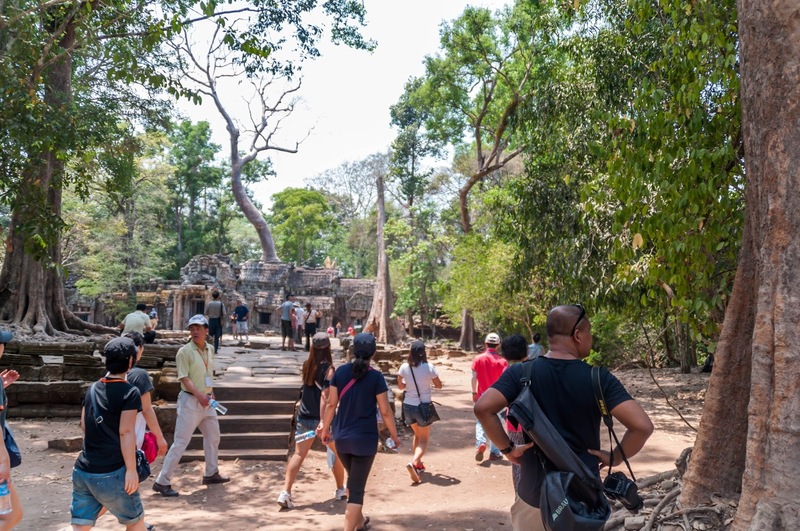 We just didn´t climb up to the highest accessible area, because there was a ridiculously long queue and it was a scorching day anyway. 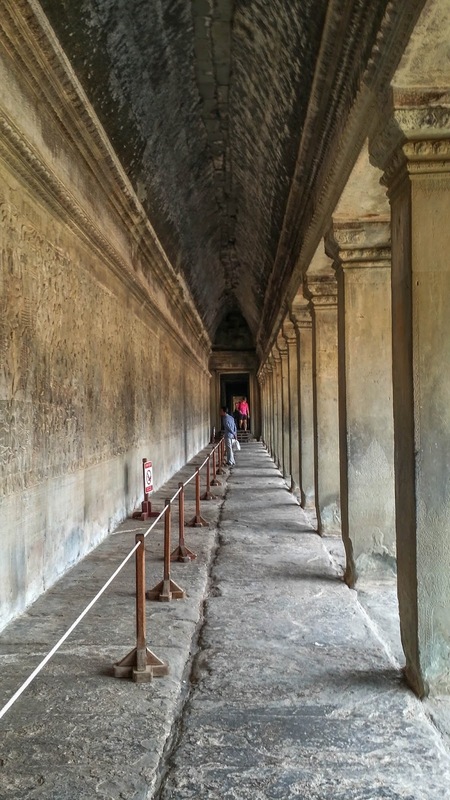 Angkor Wat was definitely the most impressive cultural and architectural achievement, I've seen so far. 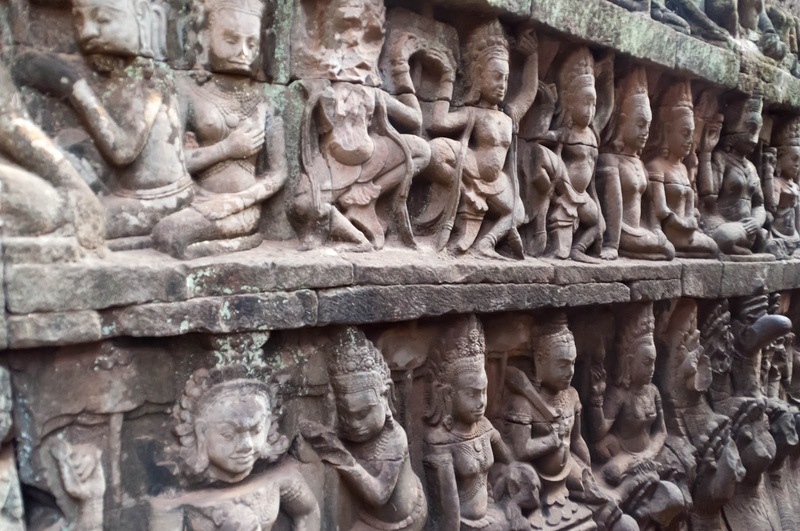 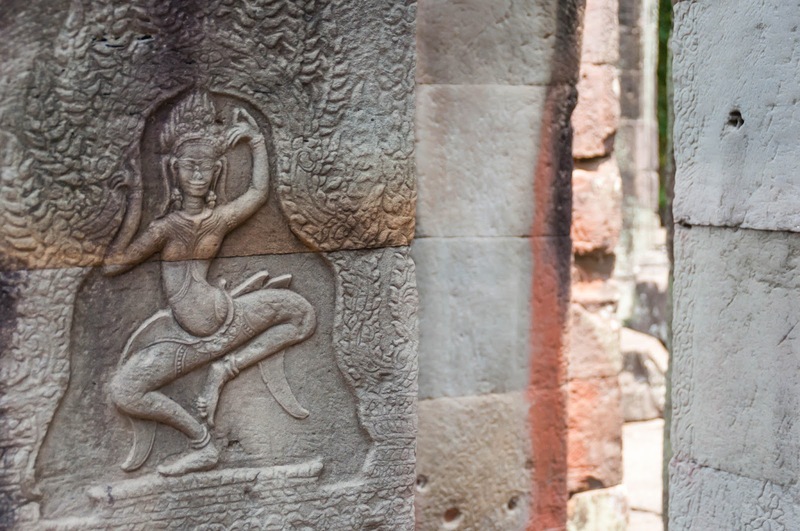 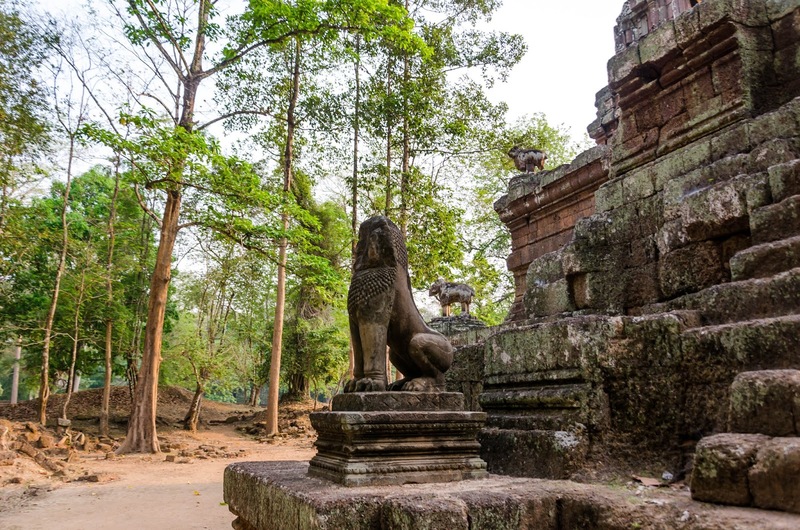 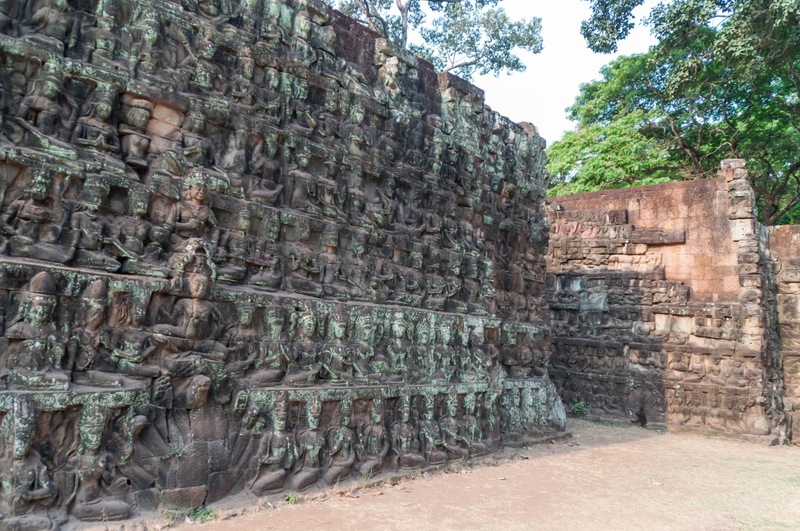 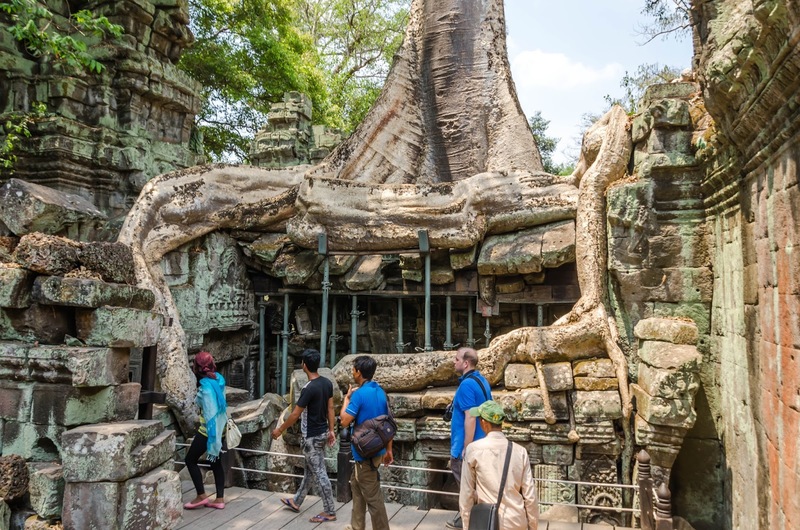 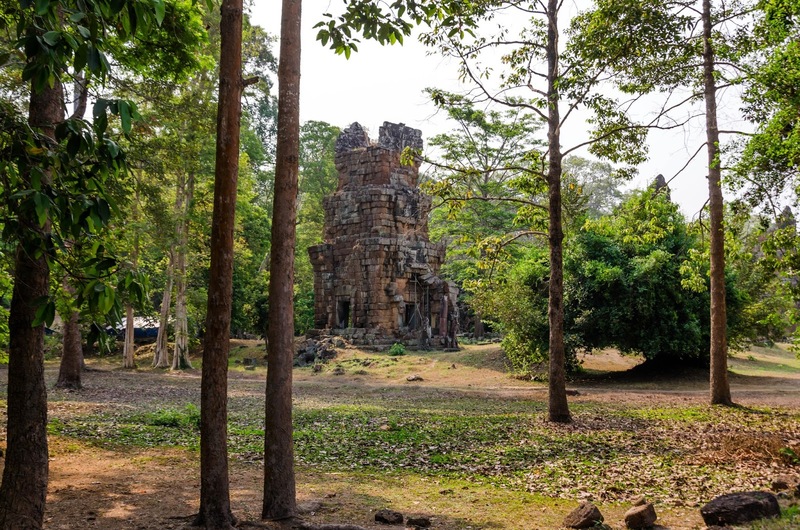 Next, we drove to Banteay Kdei, where the trees grow on the temple and where we took a look at beautiful reliefs. 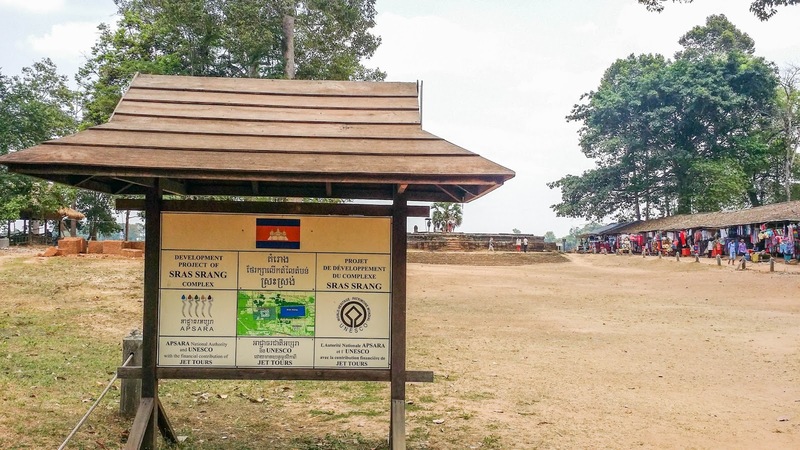 From there we walked to Srah Srang. 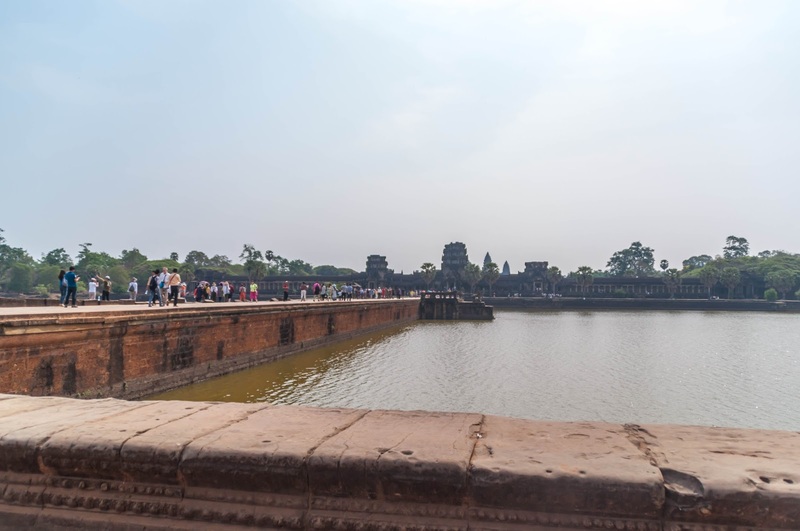 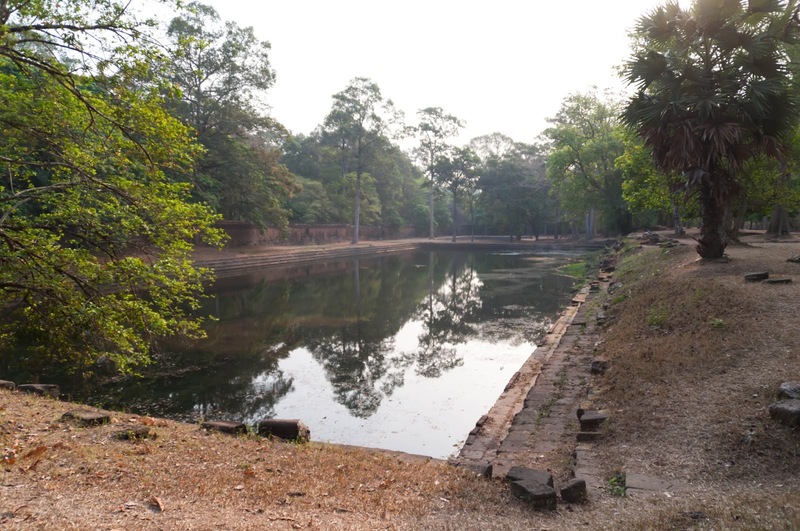 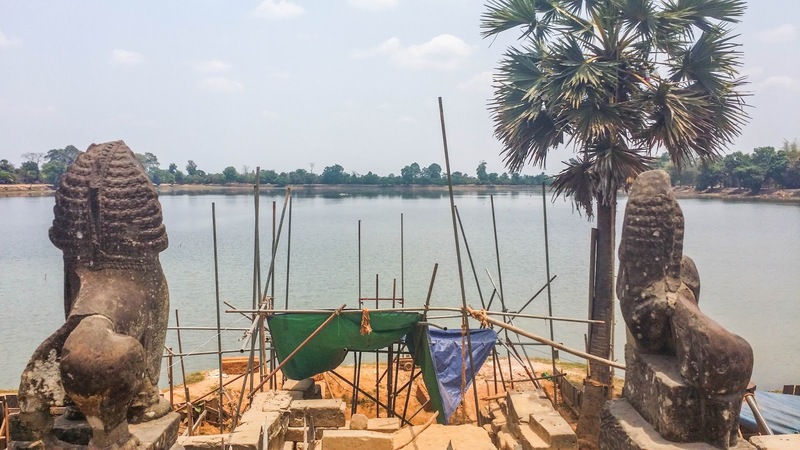 At this "royal bathing pool" - just opposite from Banteay Kdei - we took a cold drink, and I got convinced by a very determined young saleswoman, that I really needed a new t-shirt. 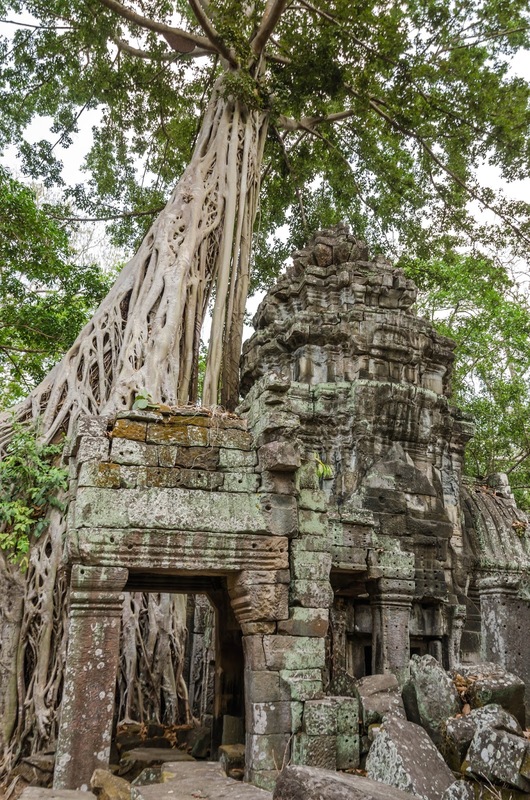 The last temple of the day was the impressive Ta Phrom Temple. 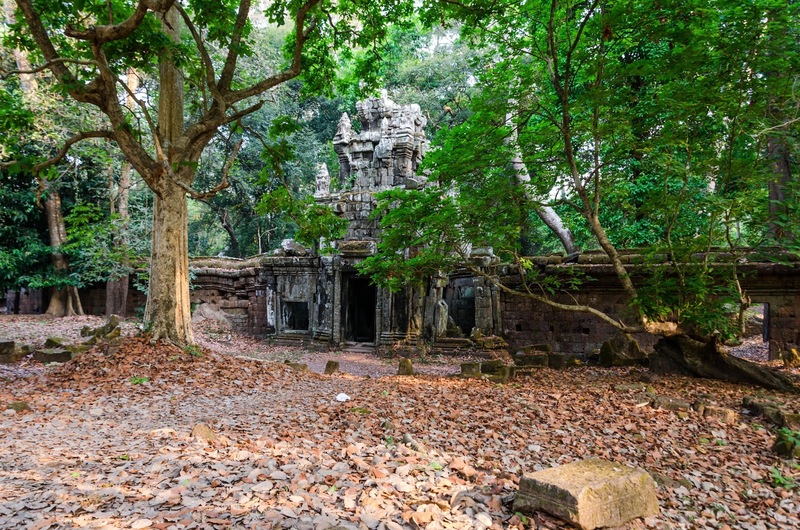 Those who have watched "Tomb Raider" must be familiar with the place since it got worldwide attention when Angelina Jolie shot the movie "Tomb Raider" there. 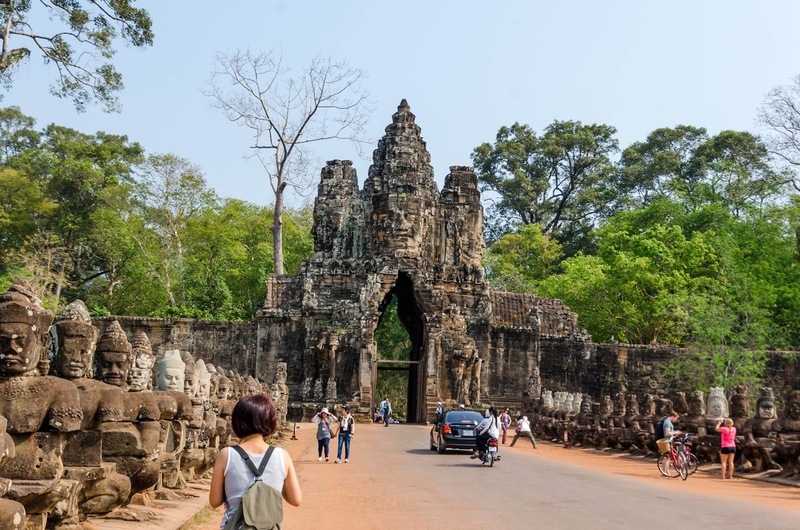 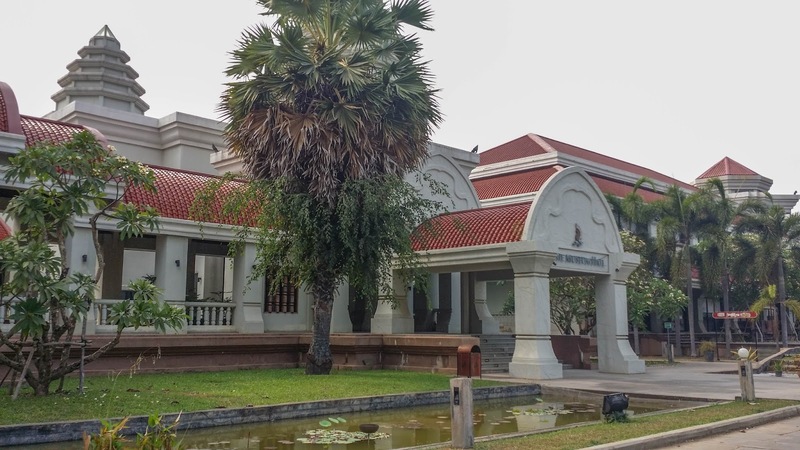 Finally, we drove to our last stop, the huge and modern Angkor National Museum, which gave us some information about the different architectural styles of the temples, the history of the area and the symbols on the temples. 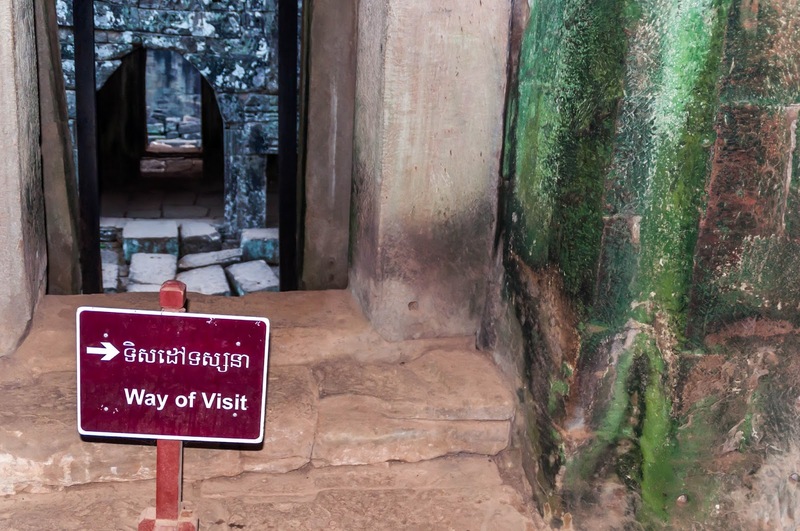 They also show movies and have quite some exhibits. 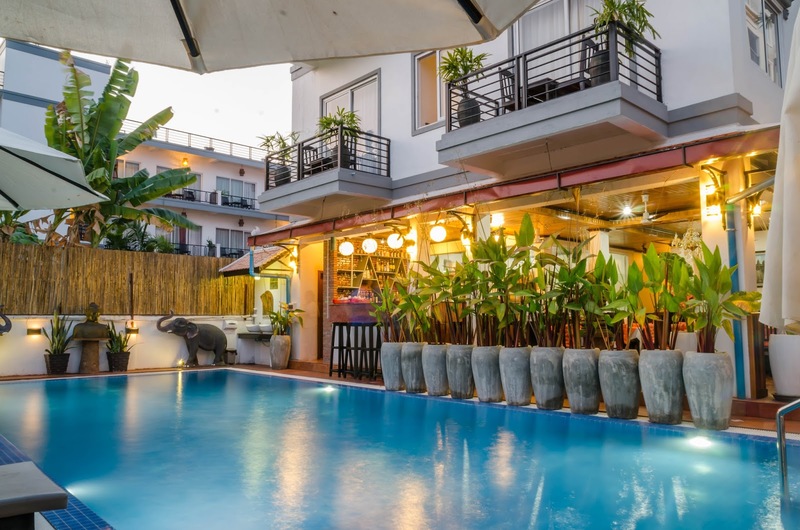 When our driver finally took us back to the hotel, we really needed to relax and went straight to the pool. 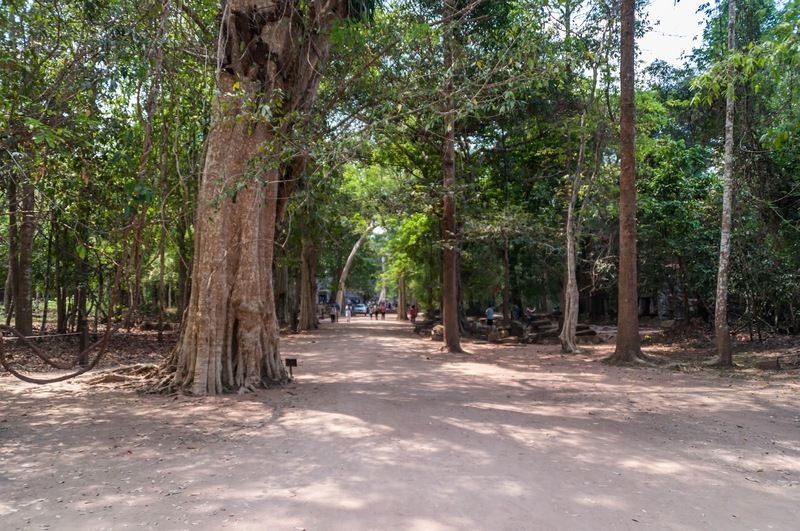 In the evening we walked to the relatively relaxed Angkor Night Market nearby our hotel for a so-so dinner in a restaurant that looked better than the food was. 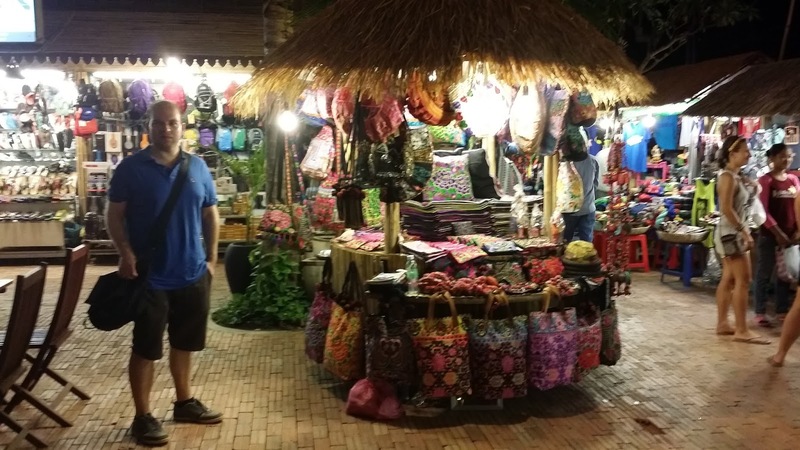 I also disappointed a saleswoman, when I ultimately decided against buying a beautiful blanket. 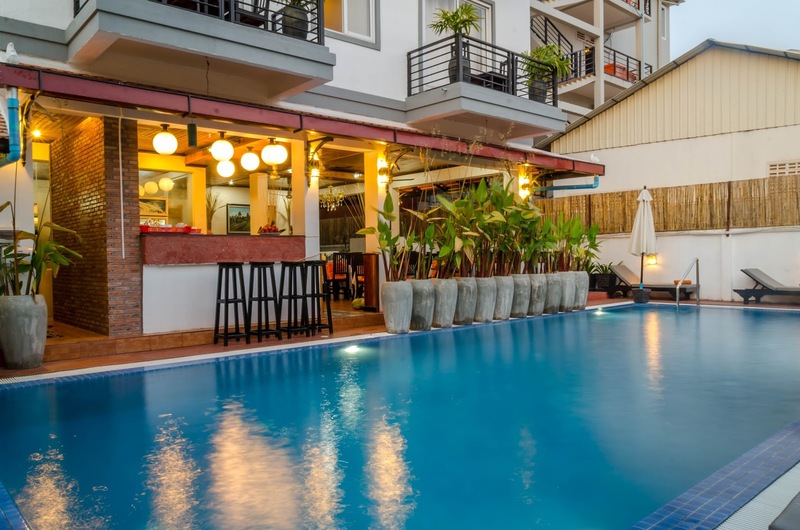 Later in the evening, back at the hotel, unfortunately, there was quite some noise from a karaoke place in the building next to ours opposite our window (including a woman screaming her lungs out with "My Heart Will Go On"). 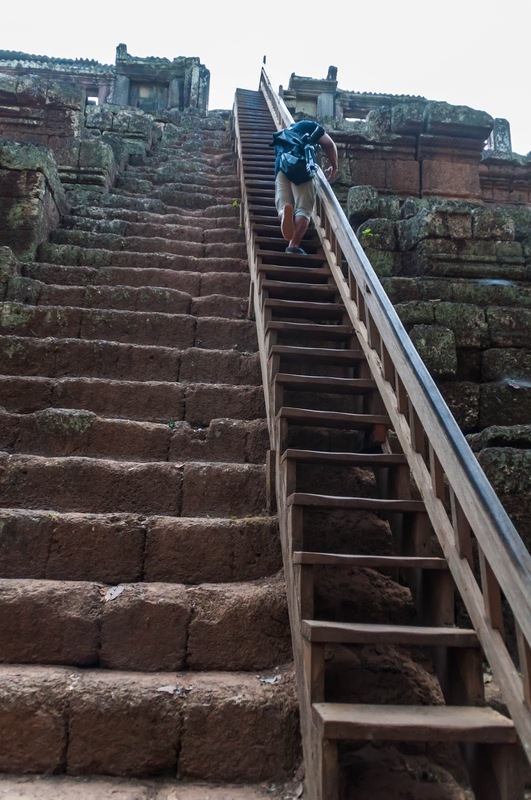 It was quite unpleasant, but thankfully, the screaming ended at midnight. 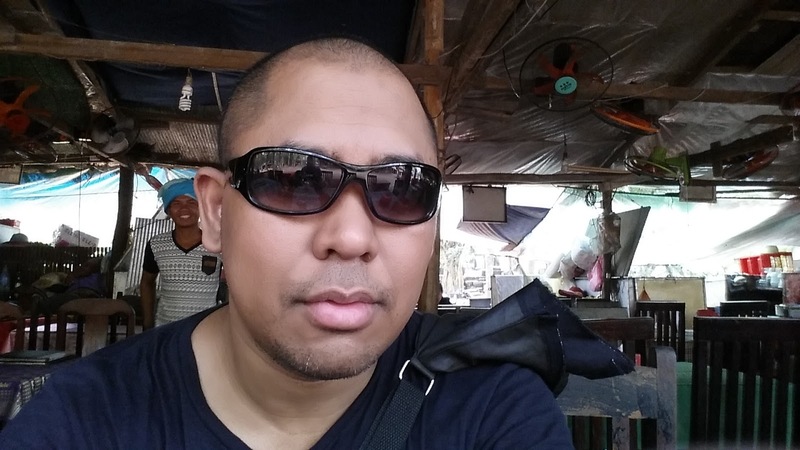 During our stay at the hotel, however, it was only on one Saturday evening a problem.